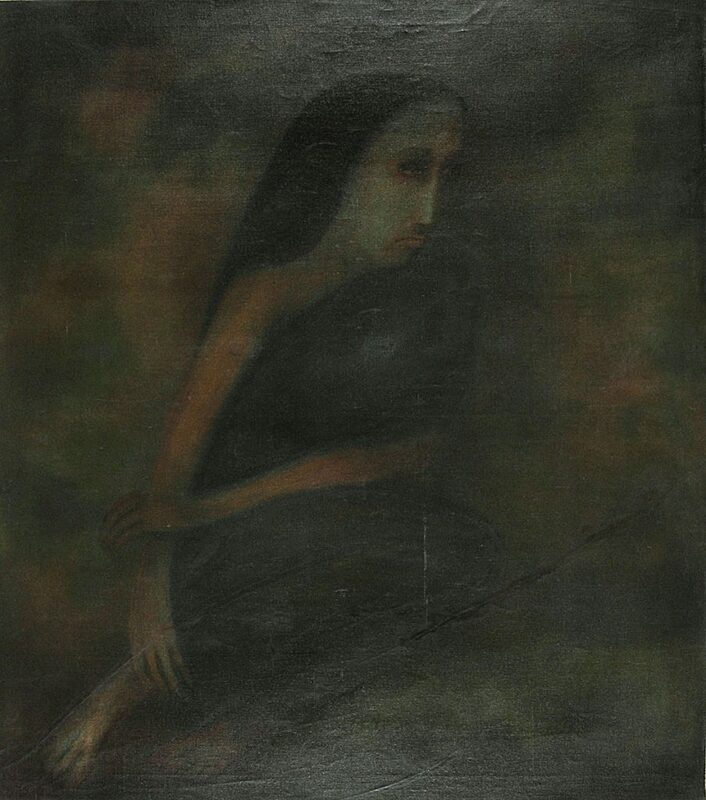 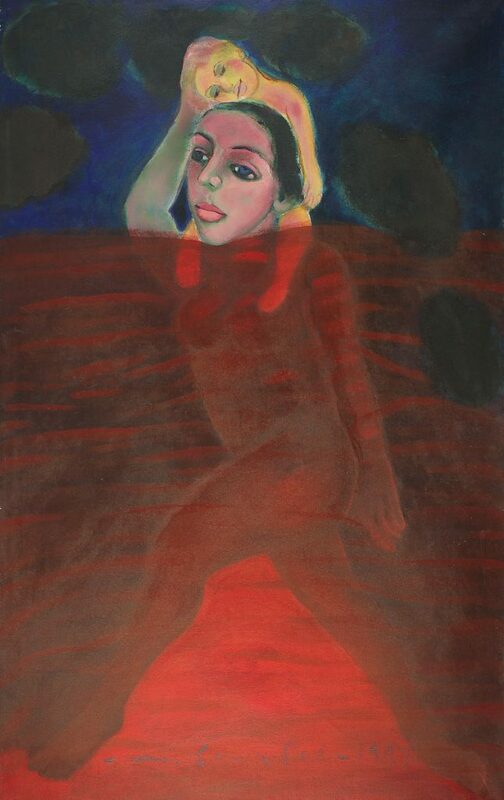 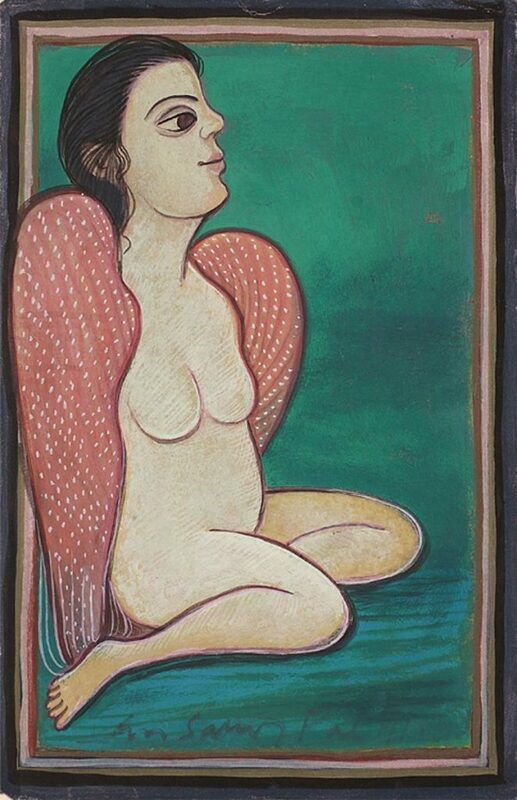 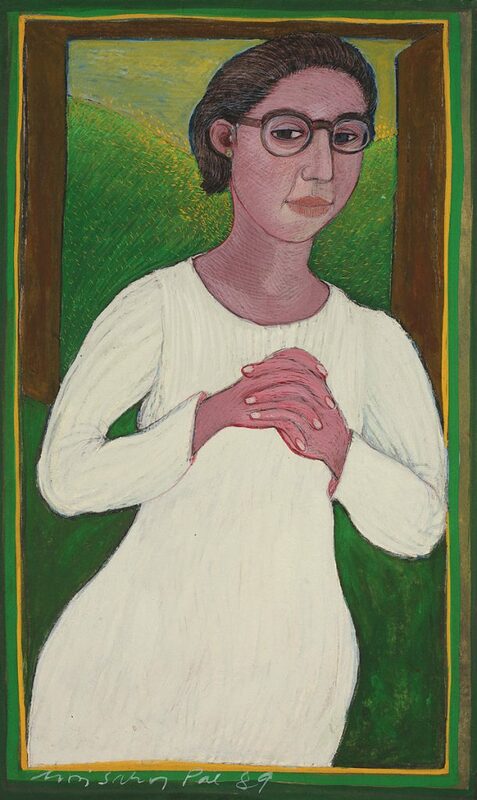 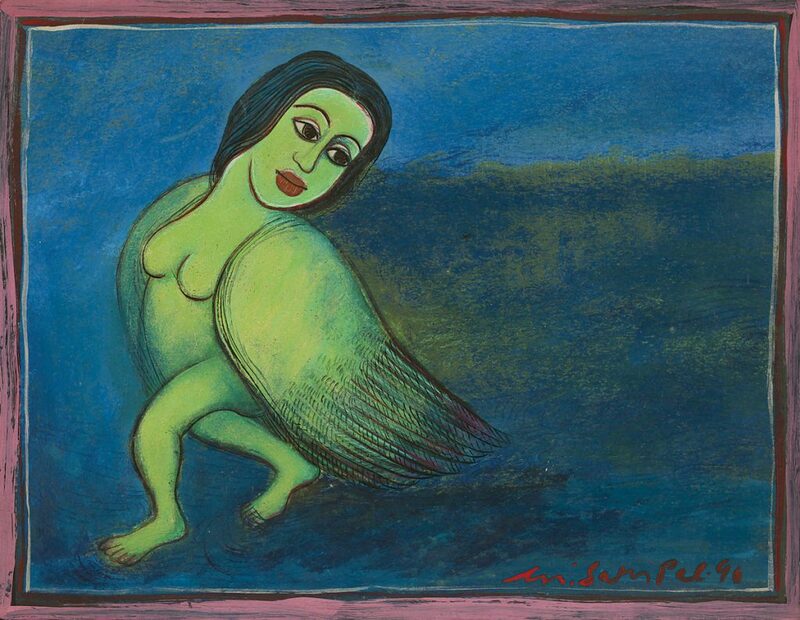 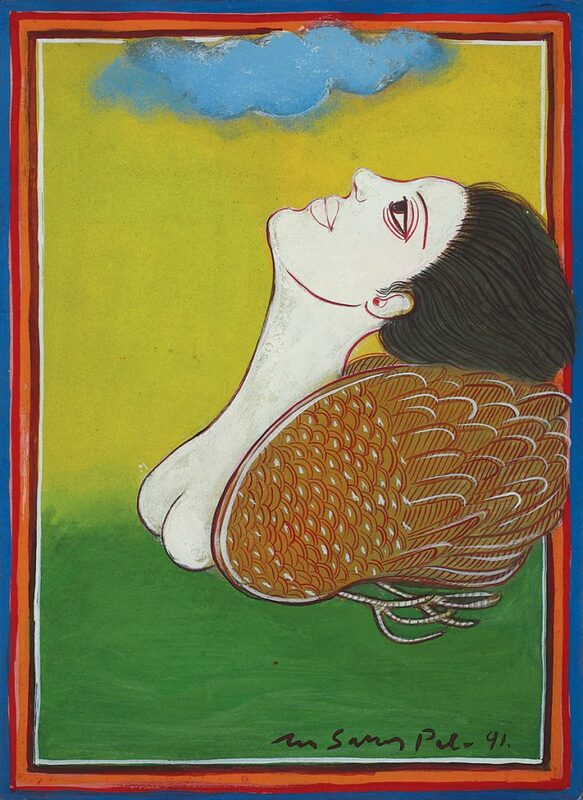 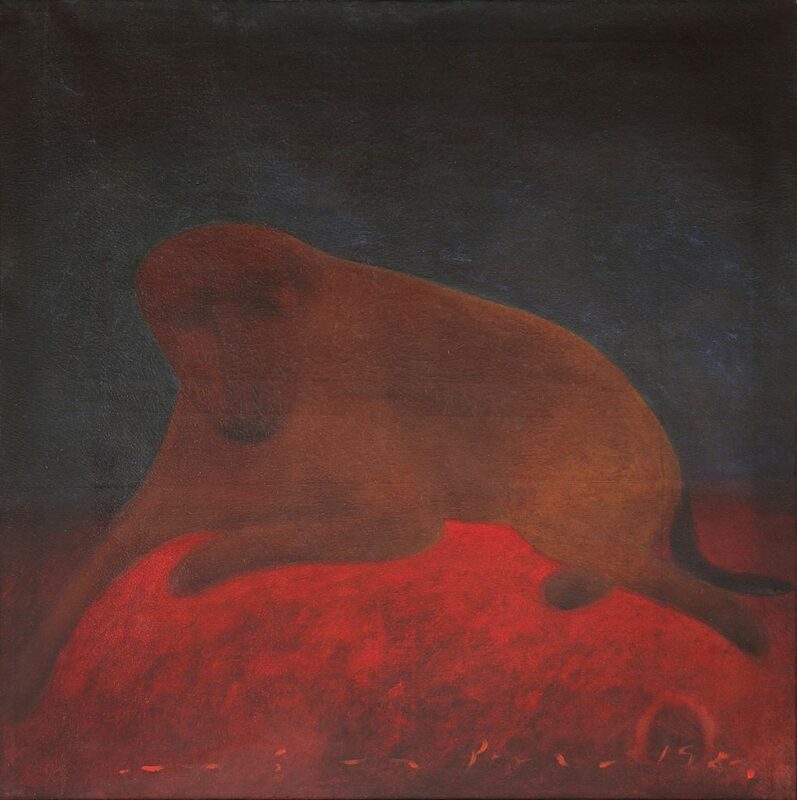 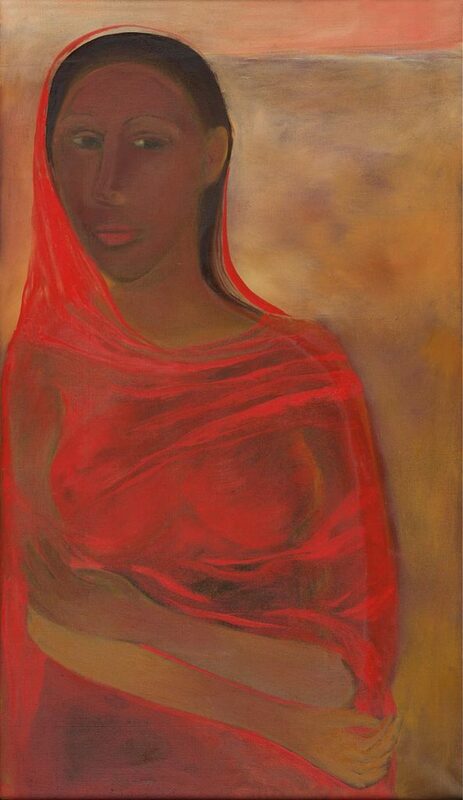 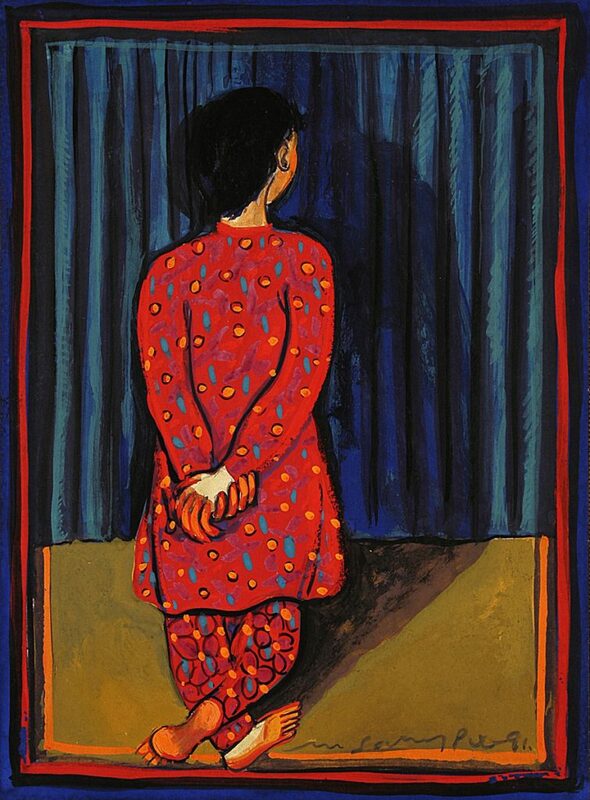 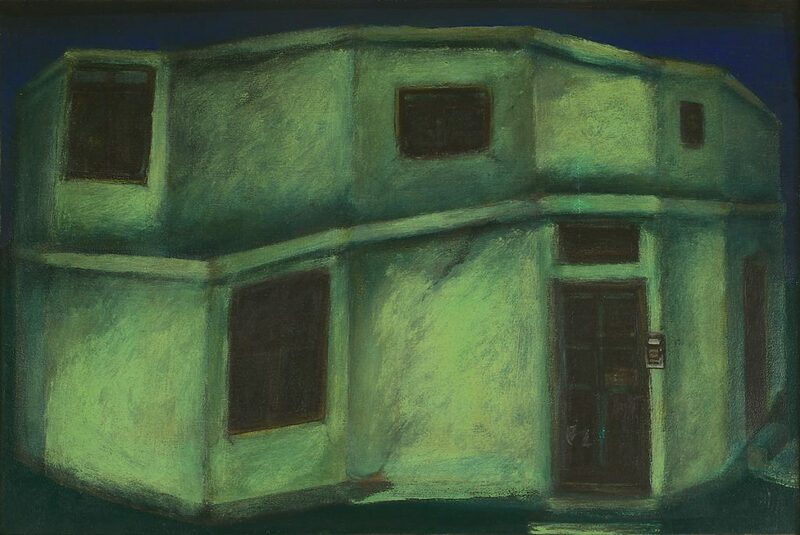 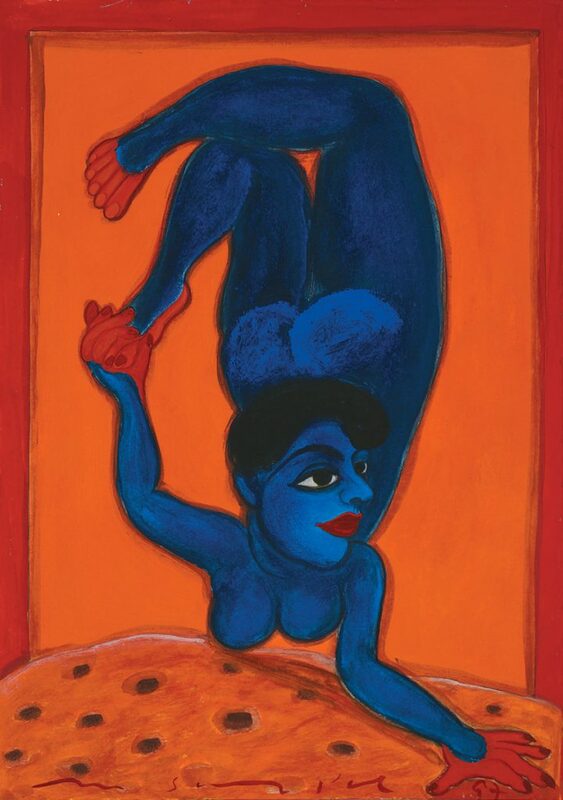 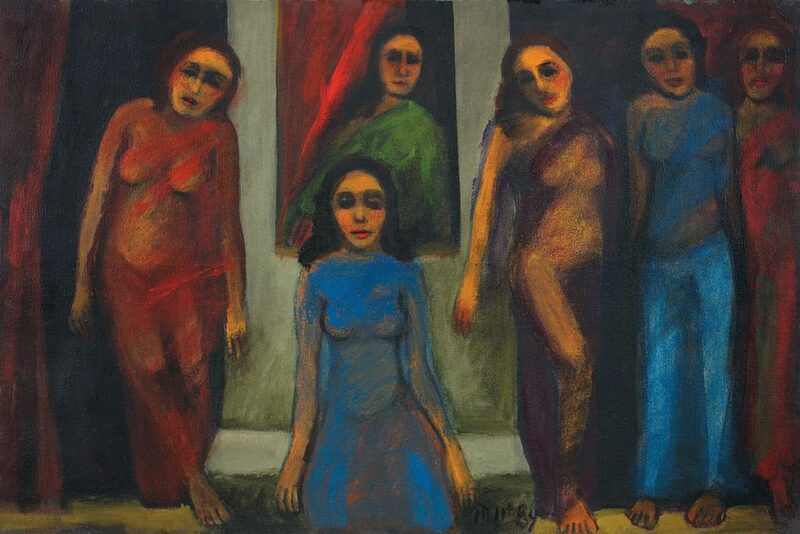 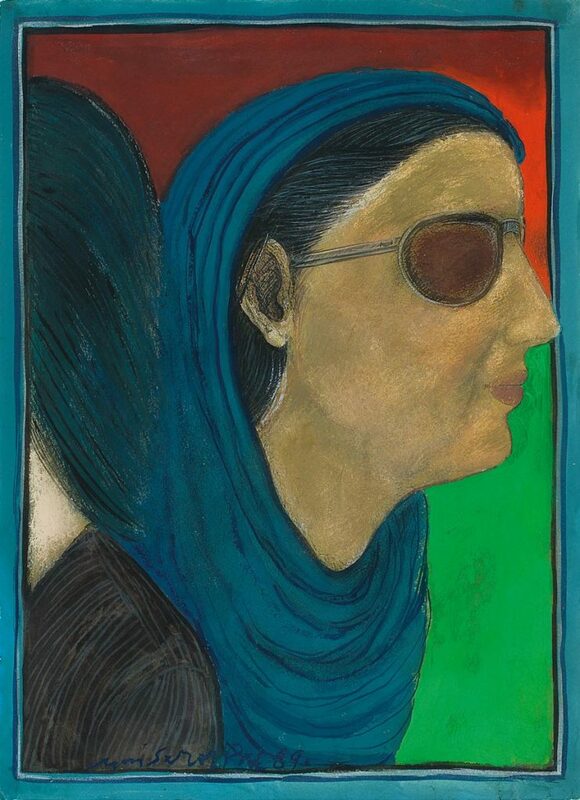 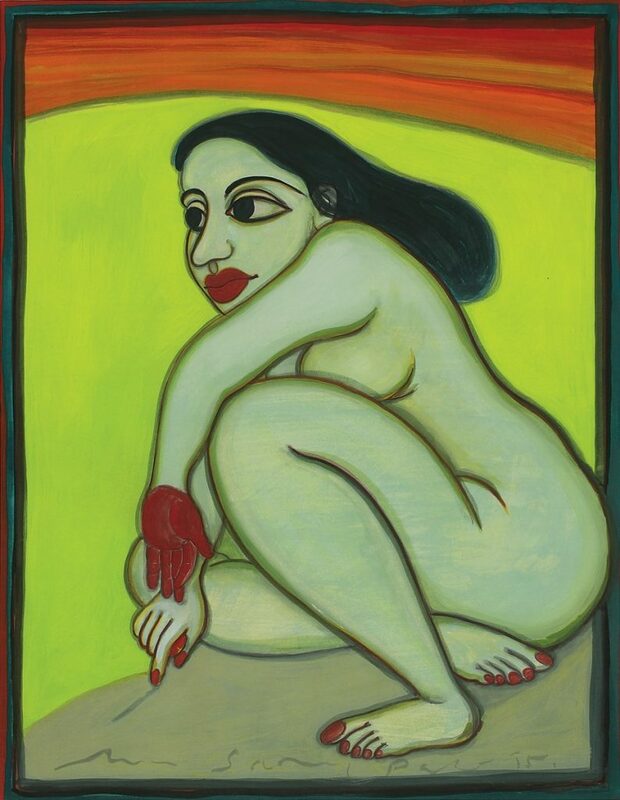 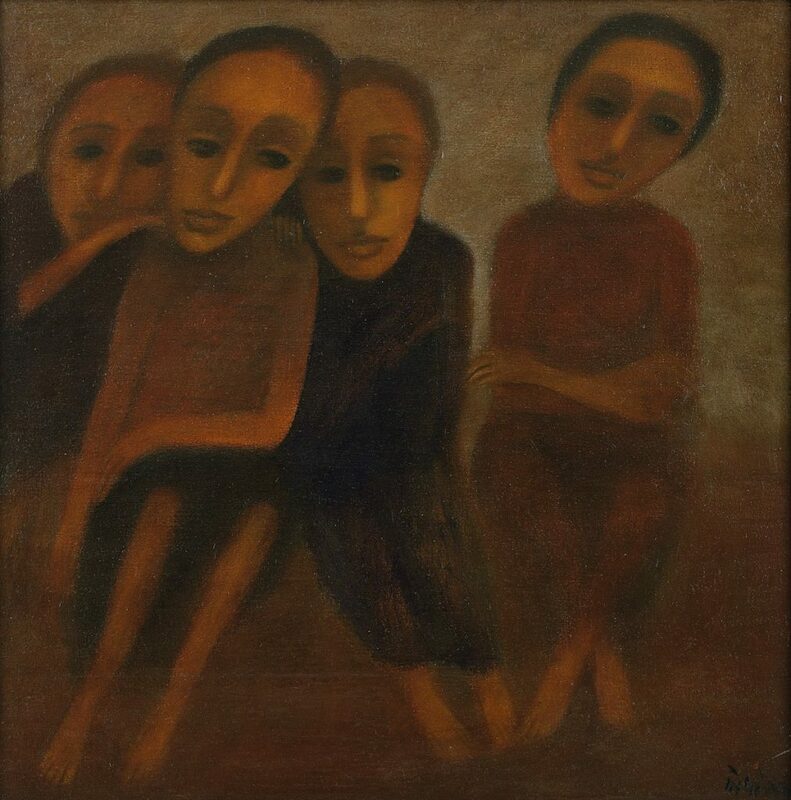 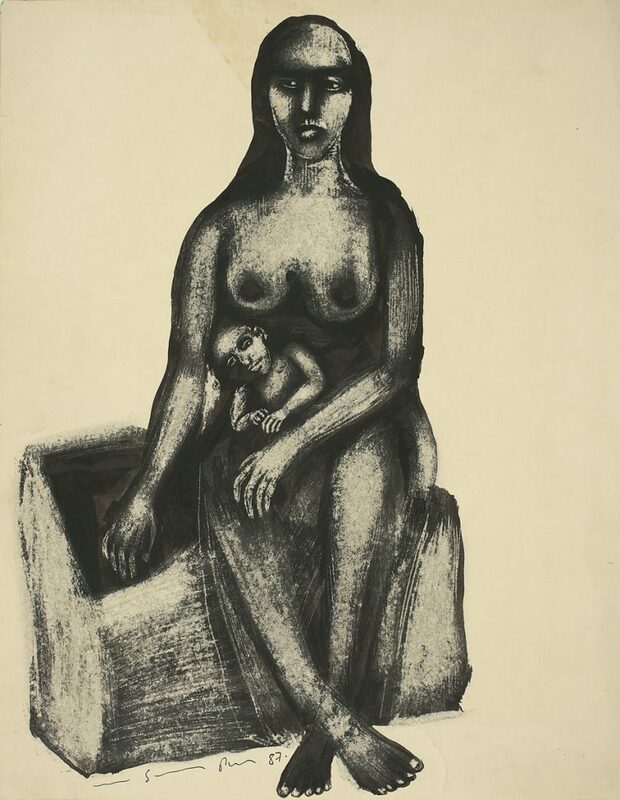 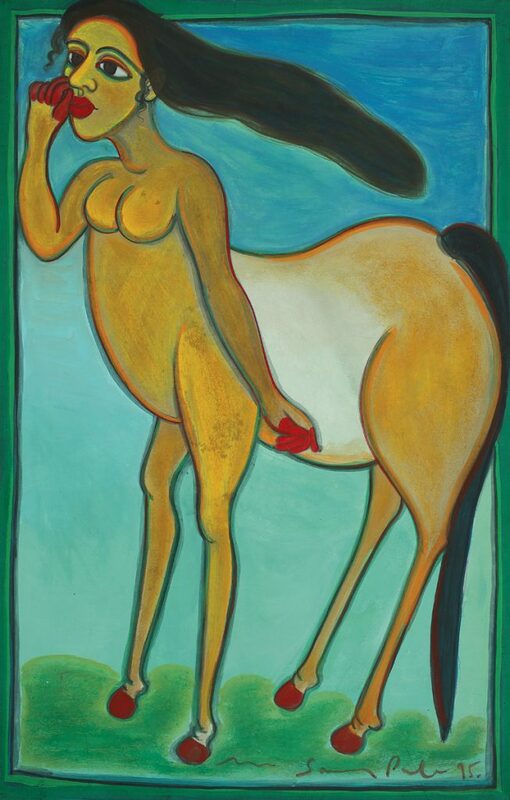 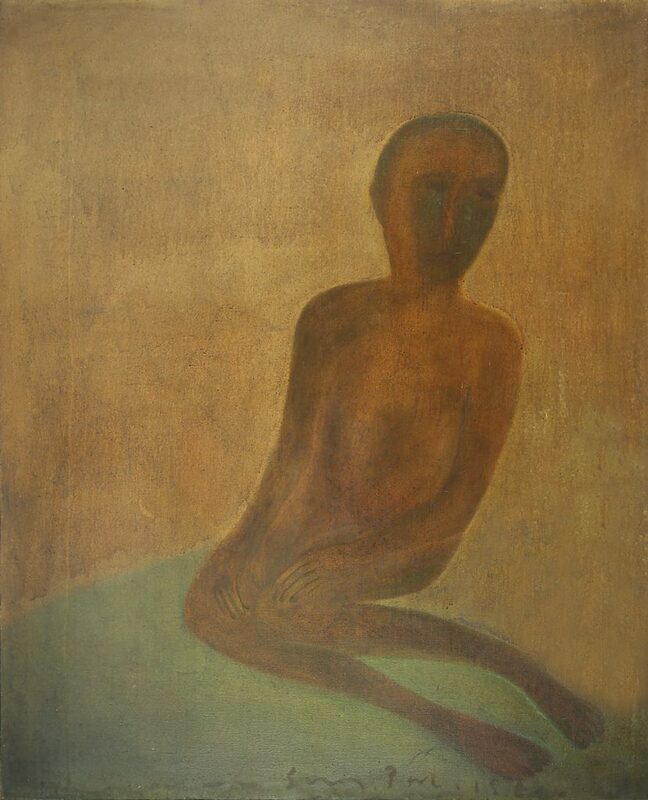 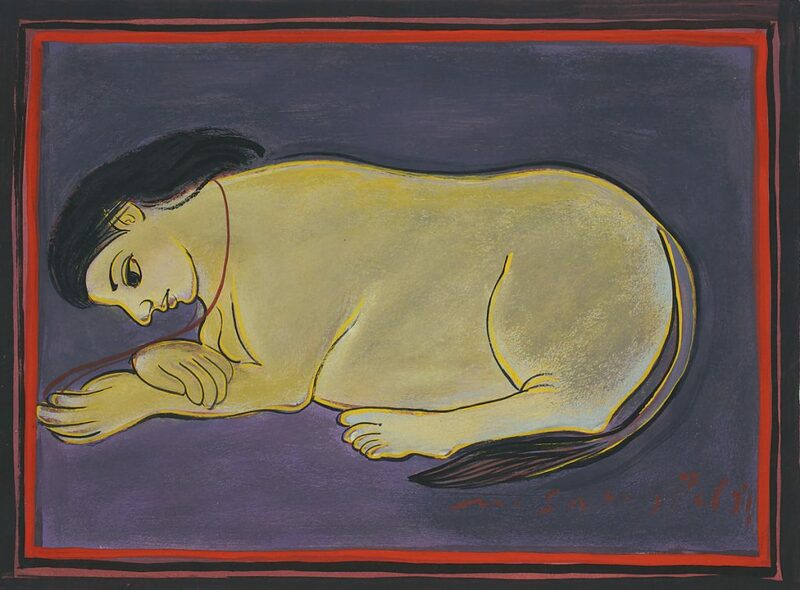 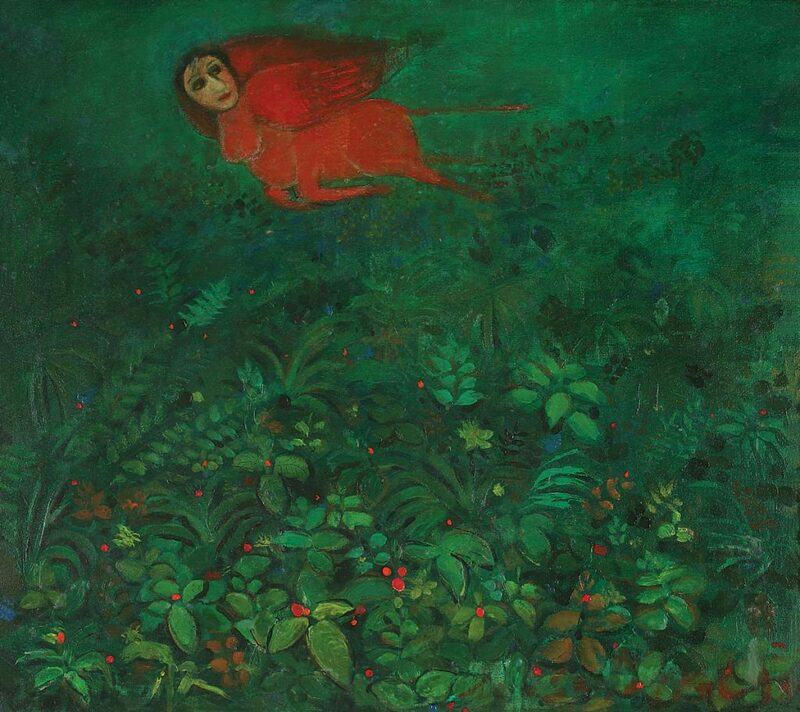 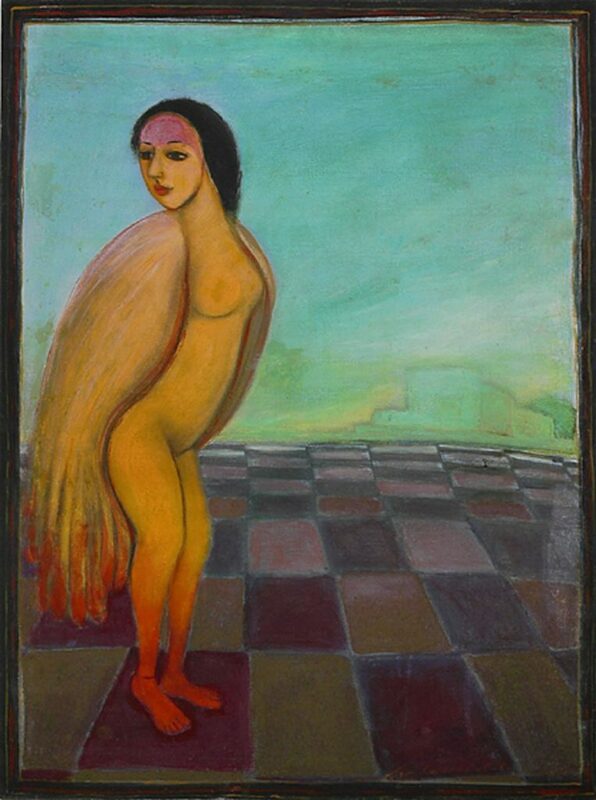 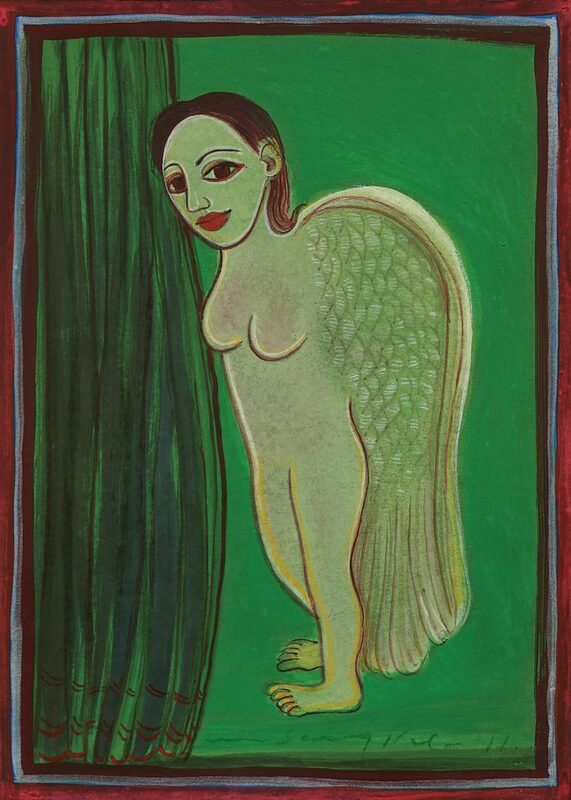 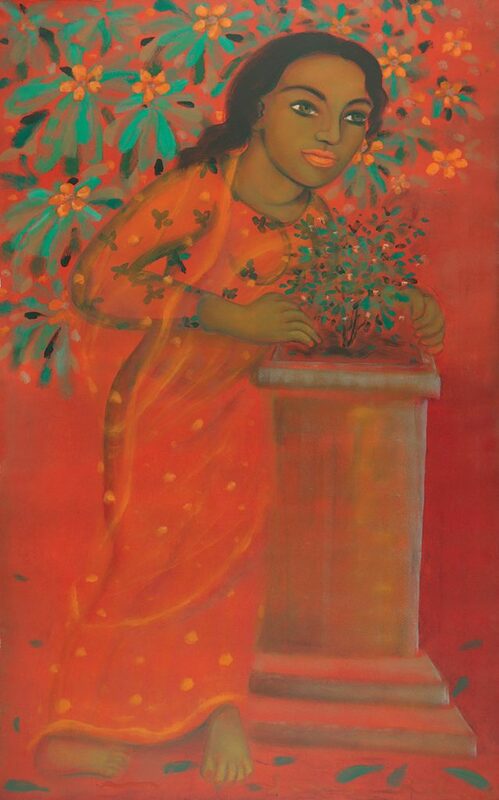 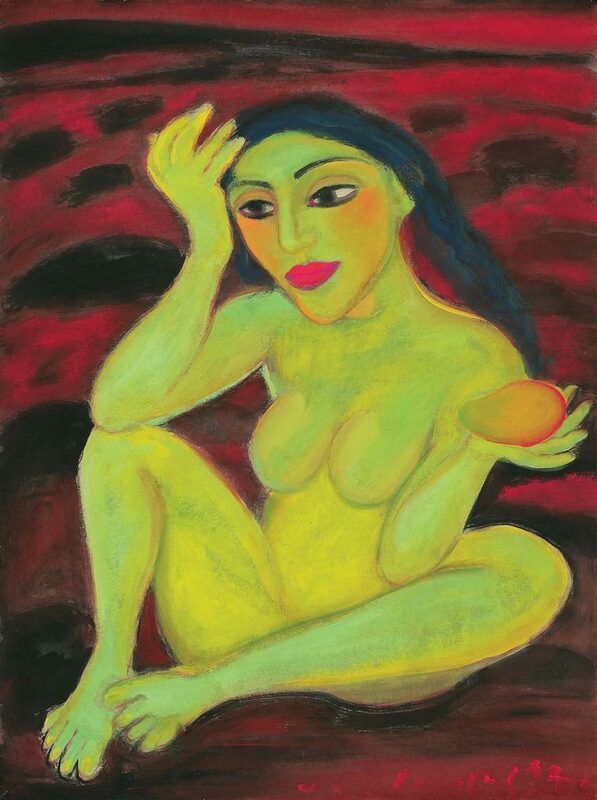 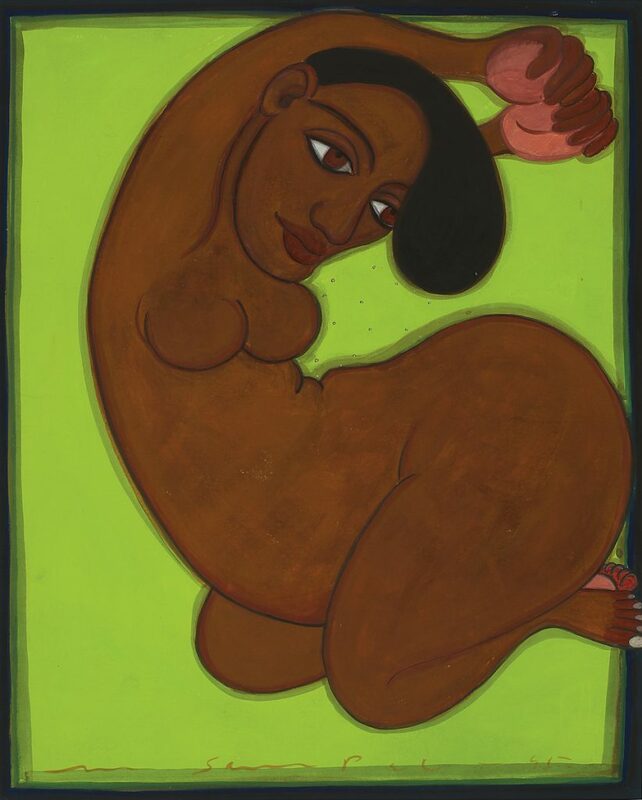 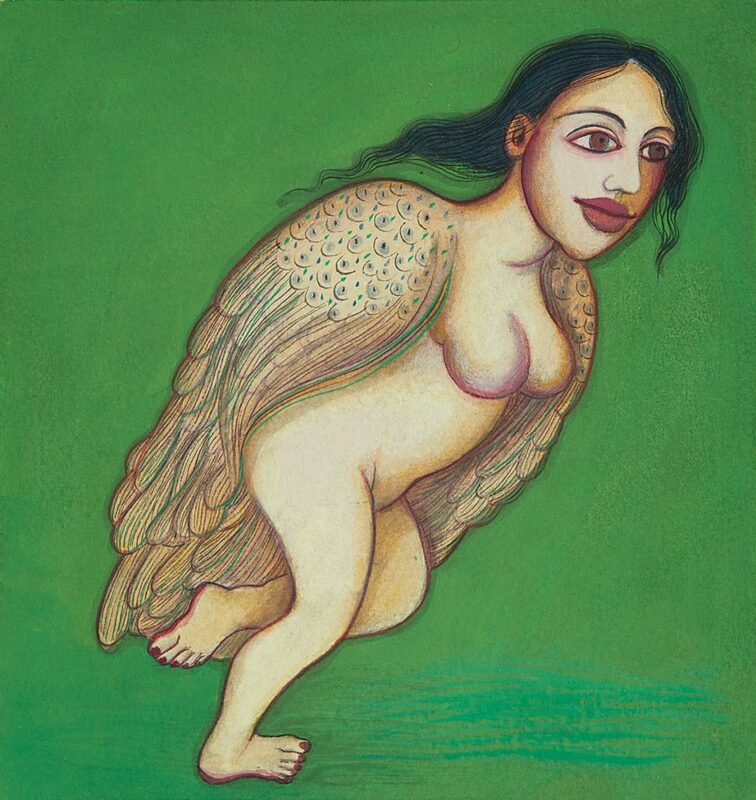 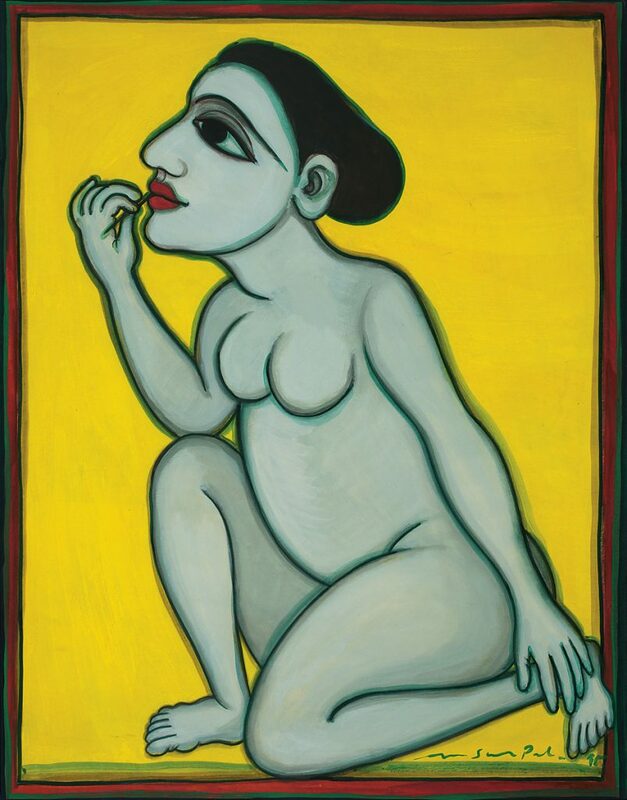 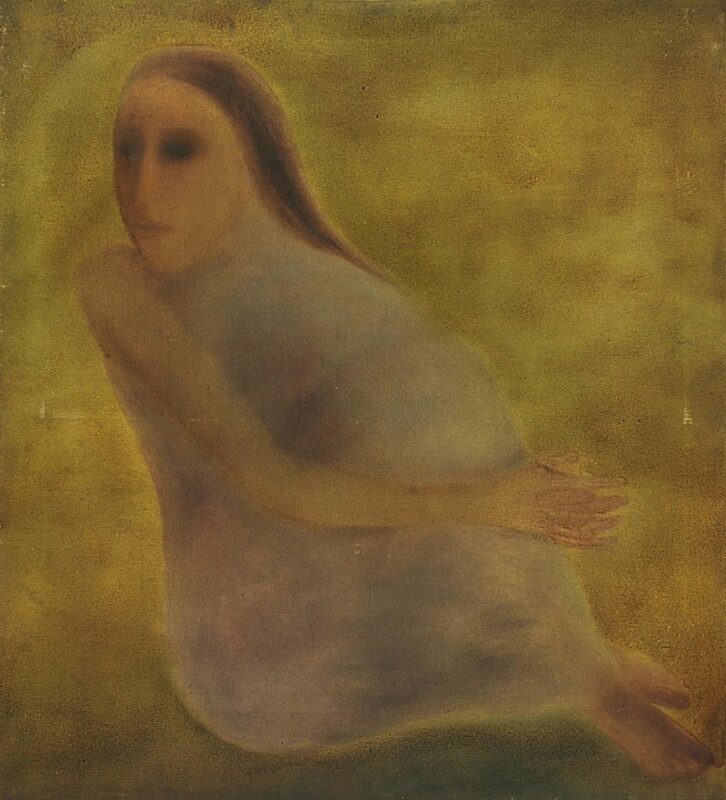 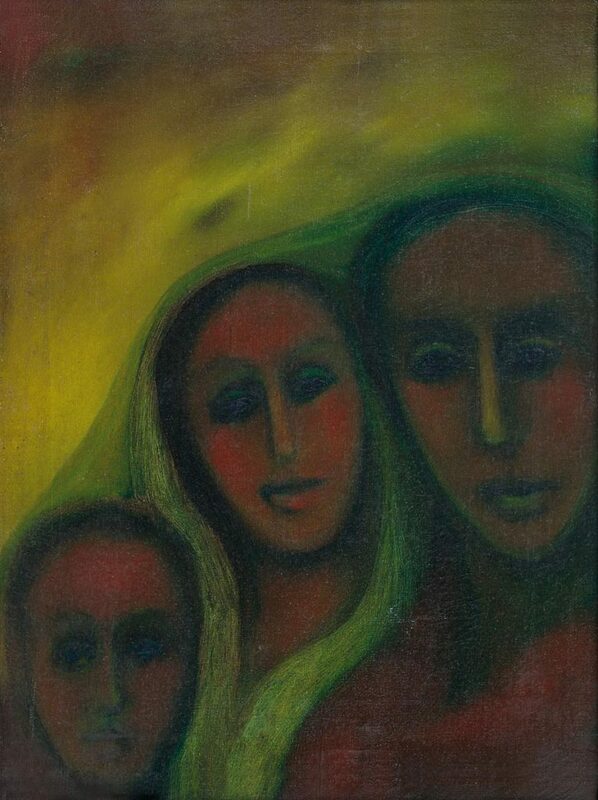 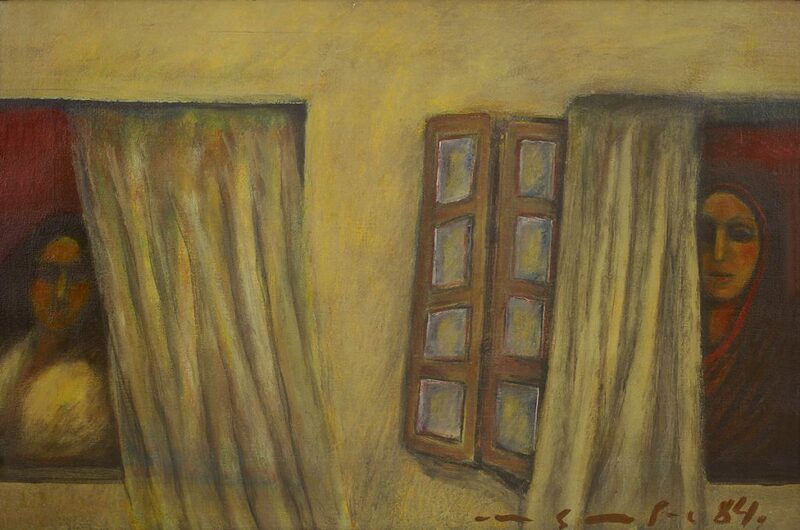 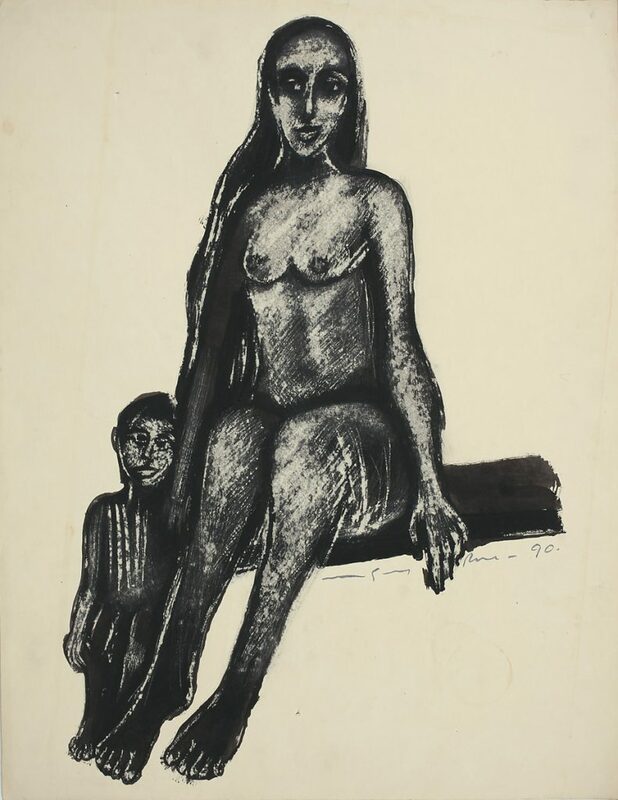 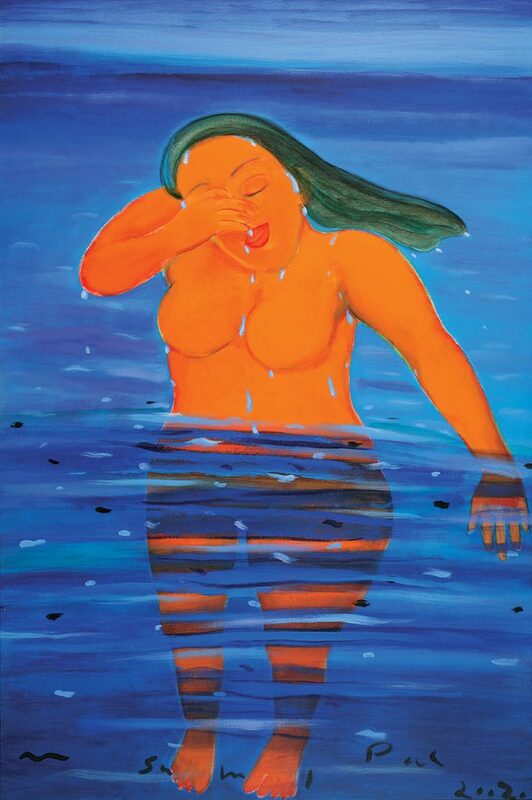 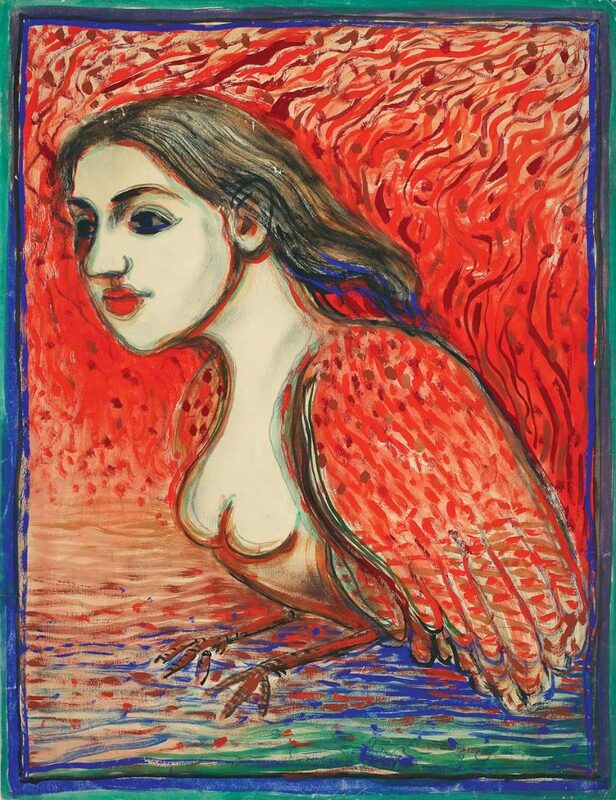 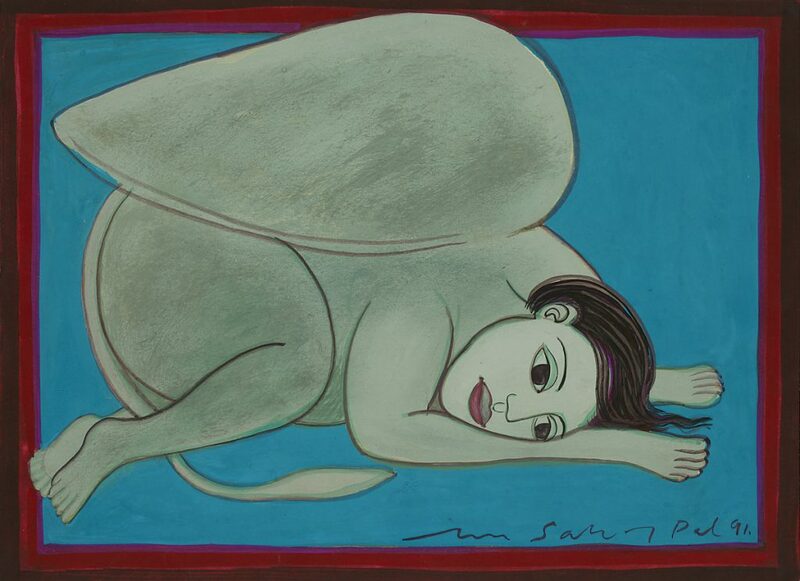 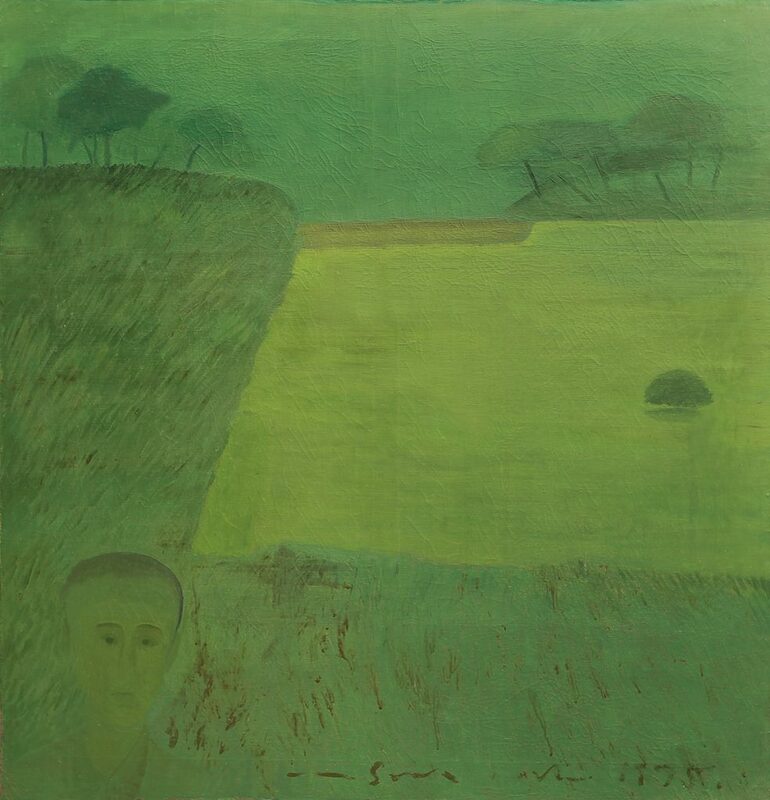 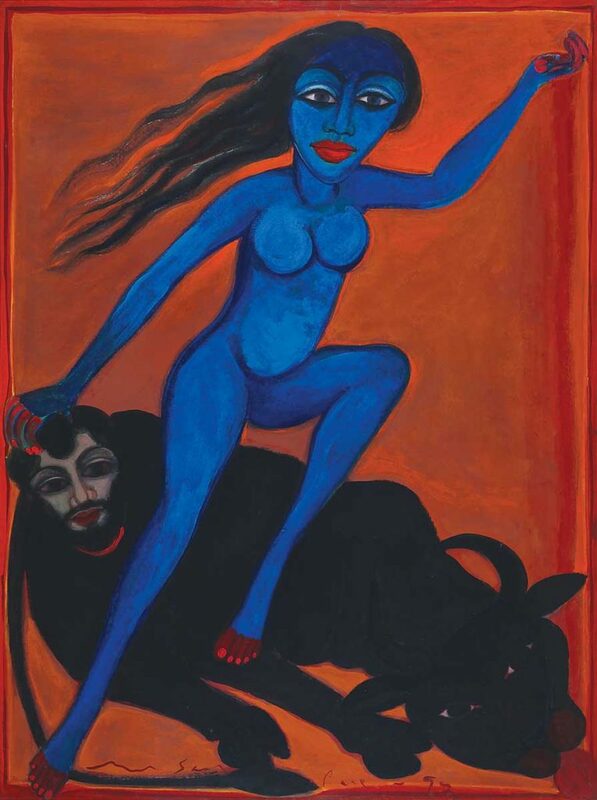 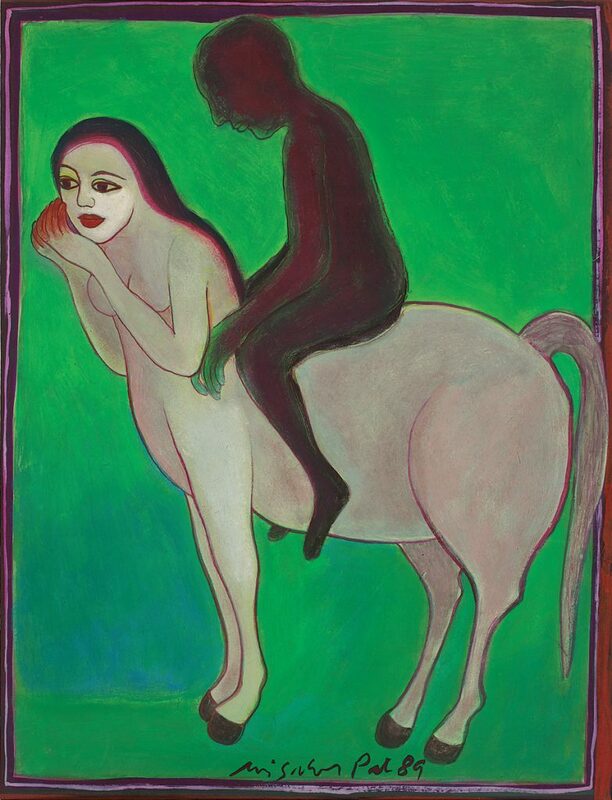 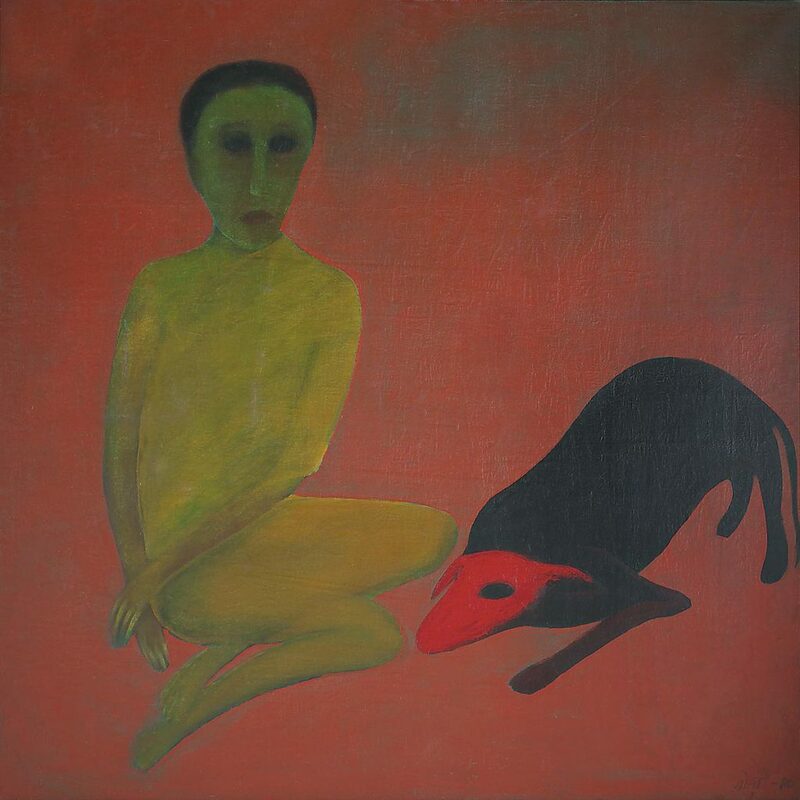 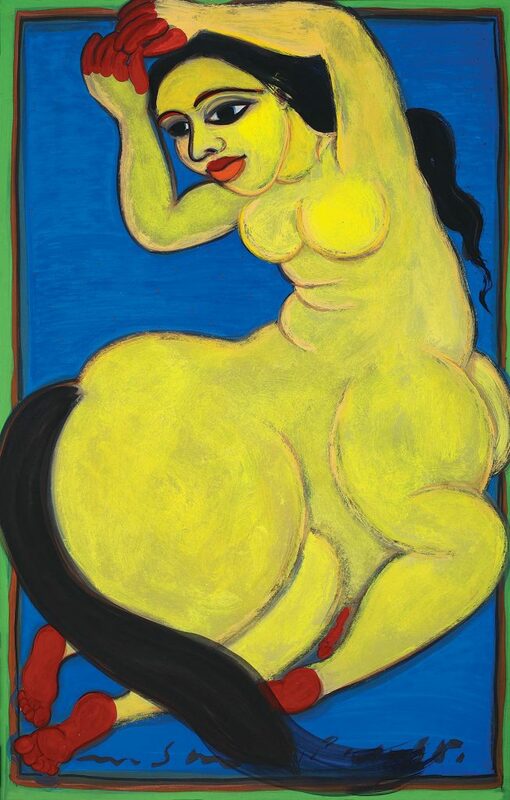 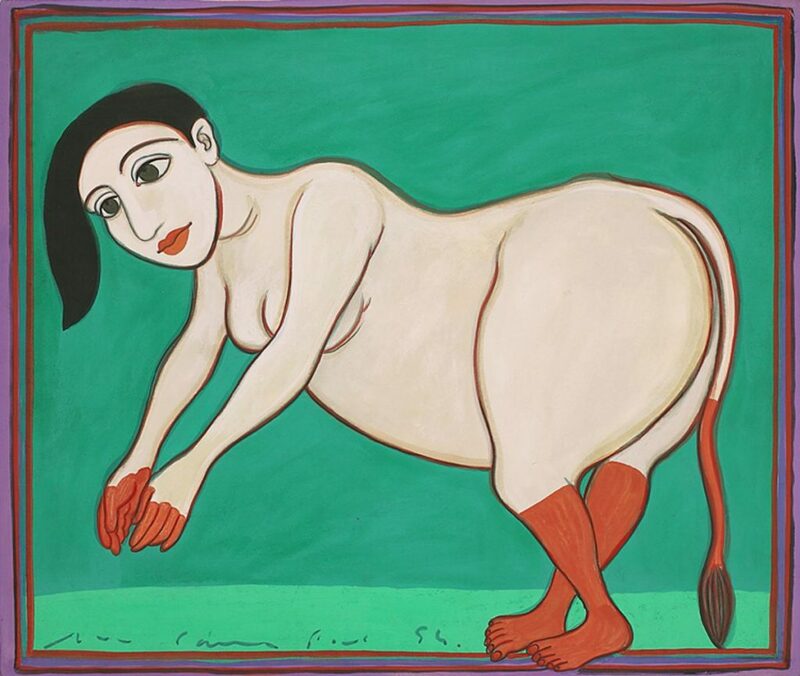 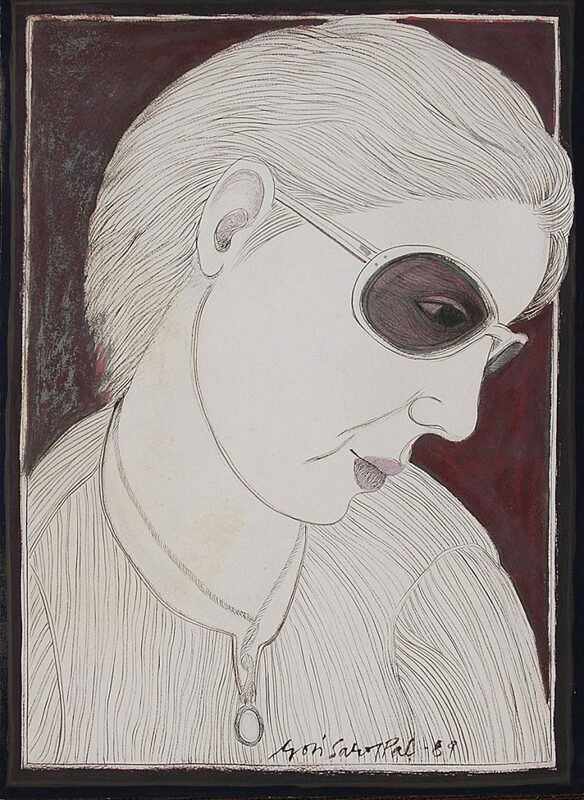 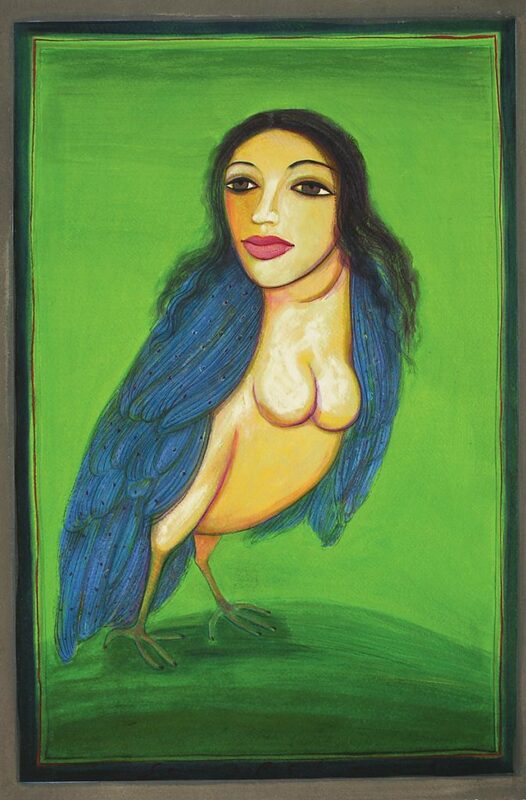 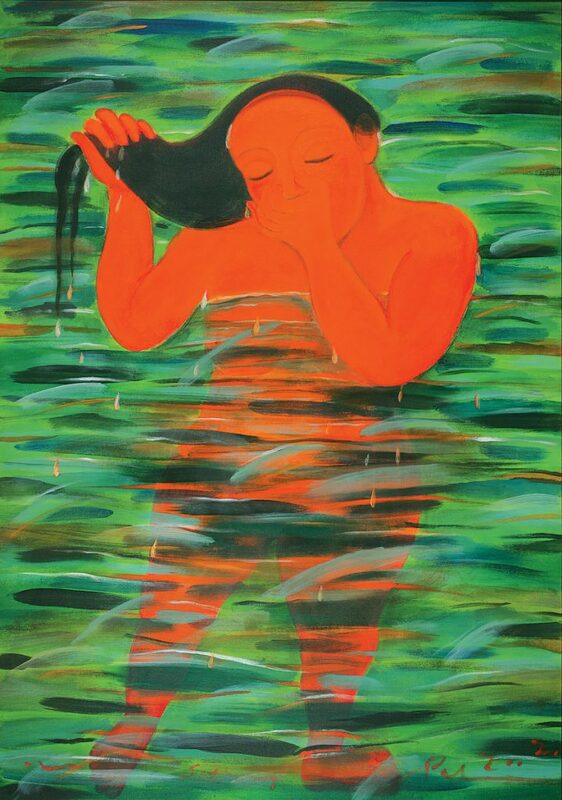 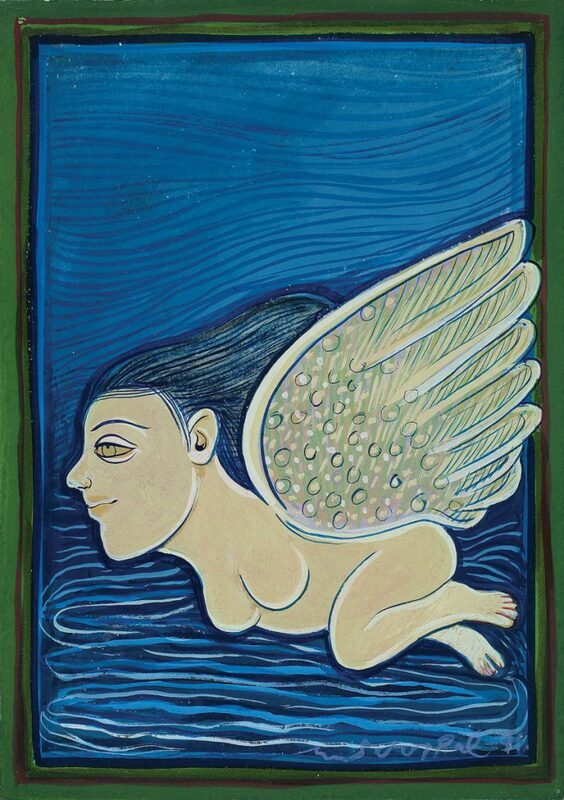 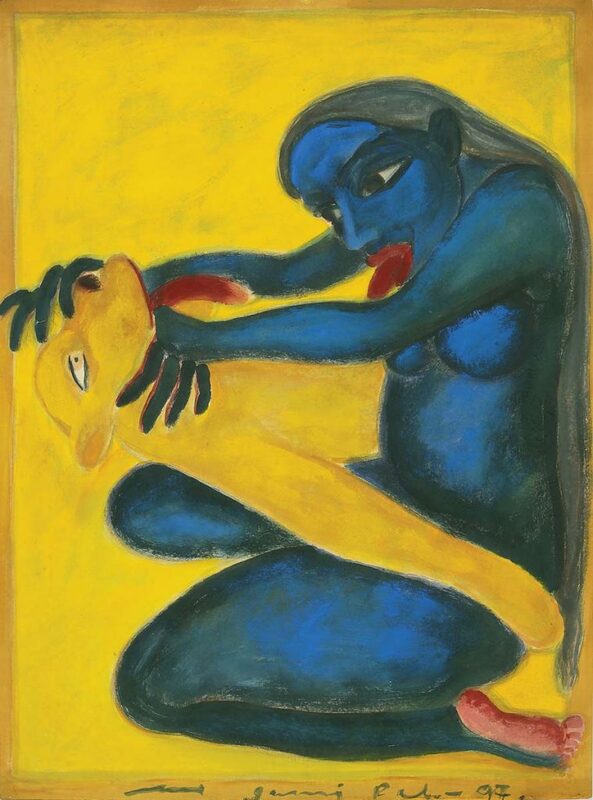 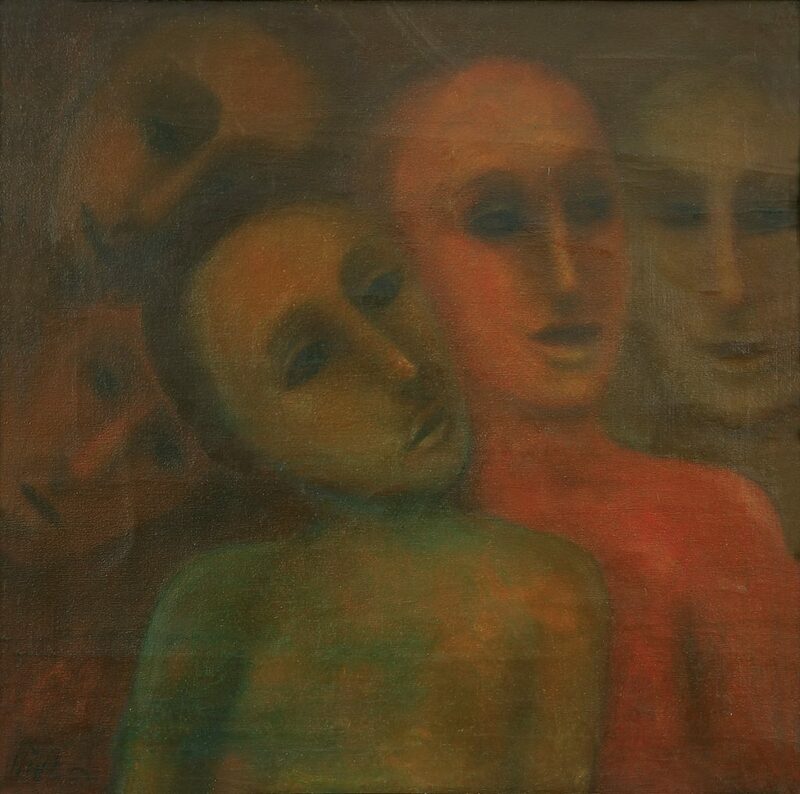 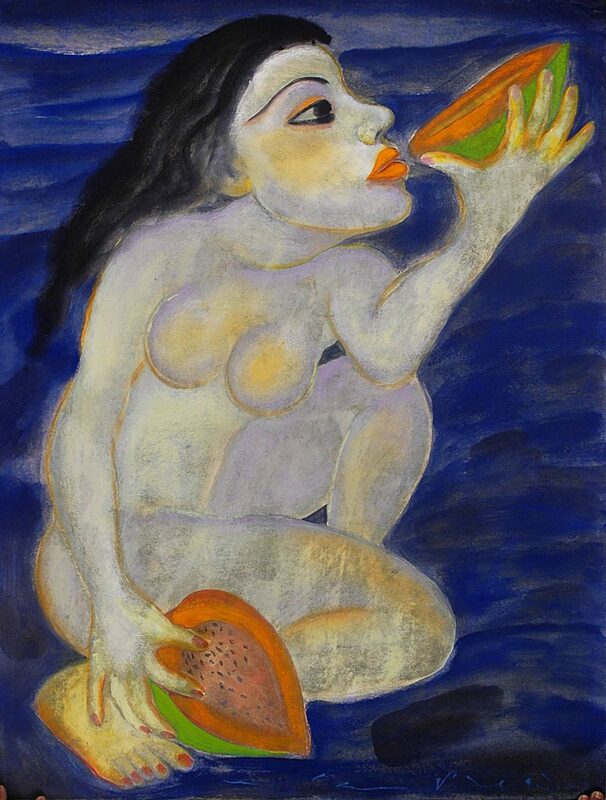 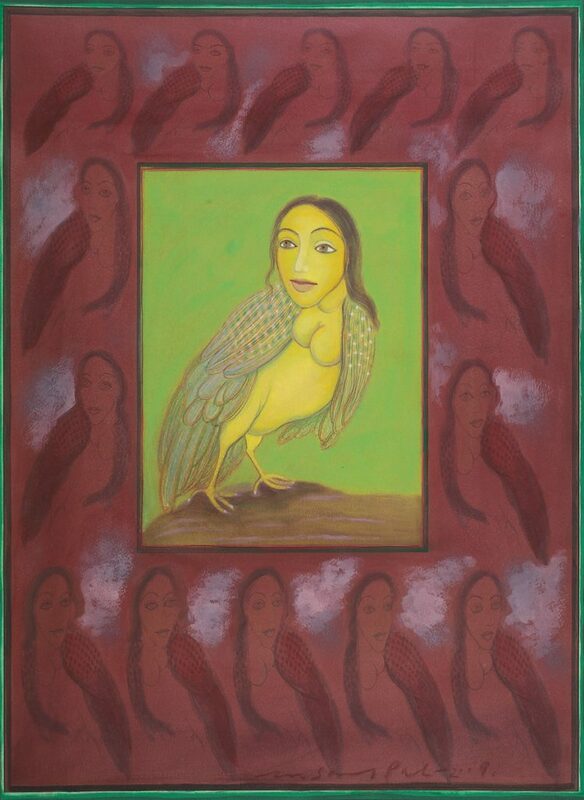 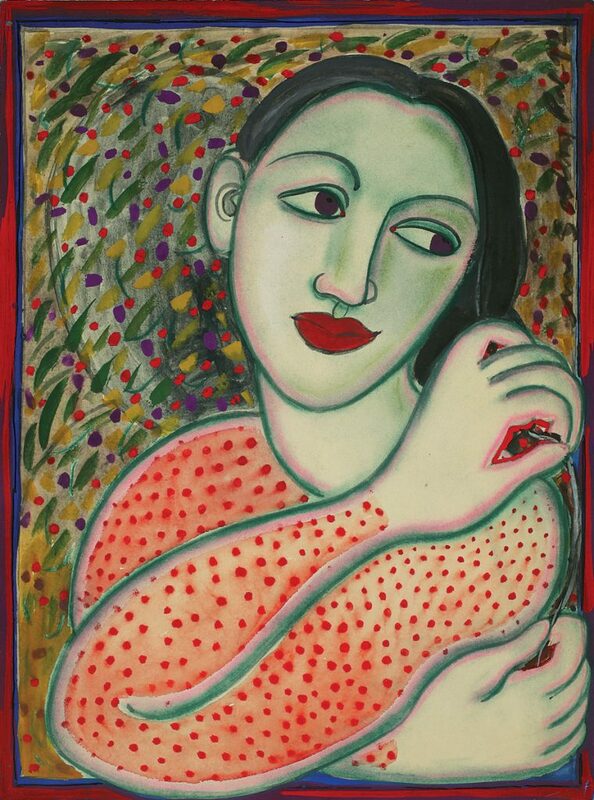 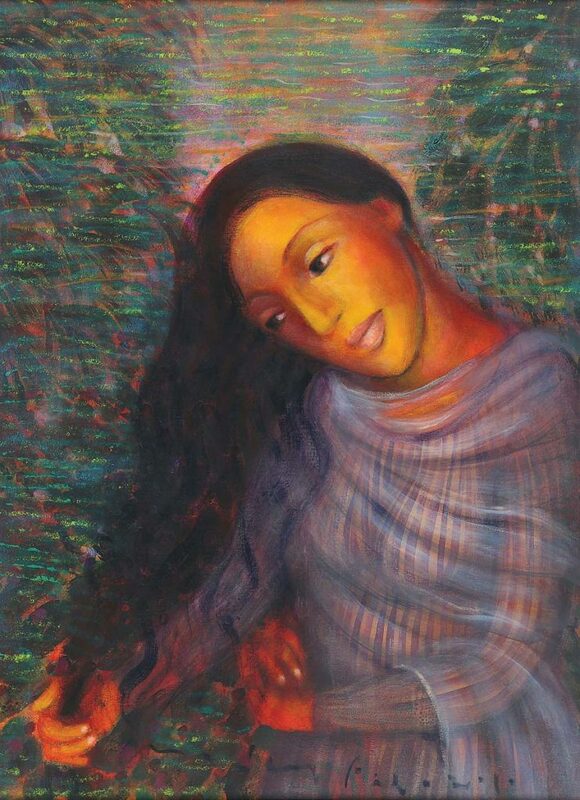 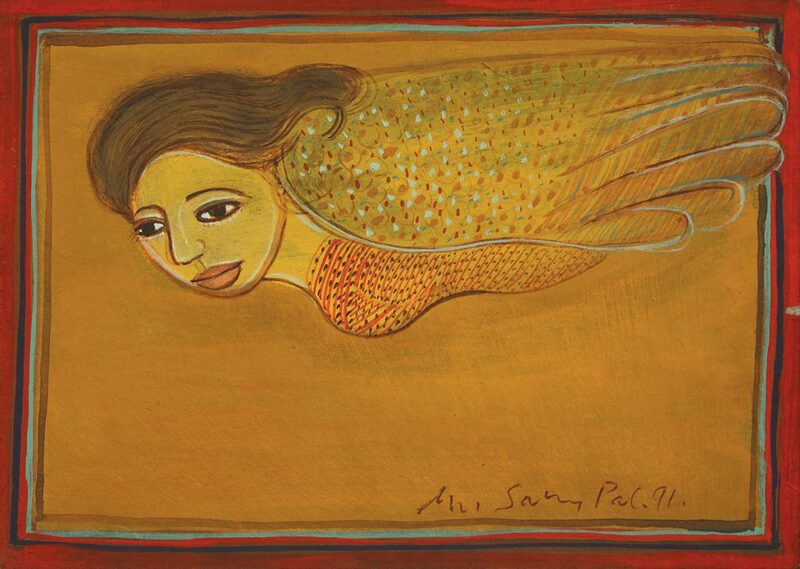 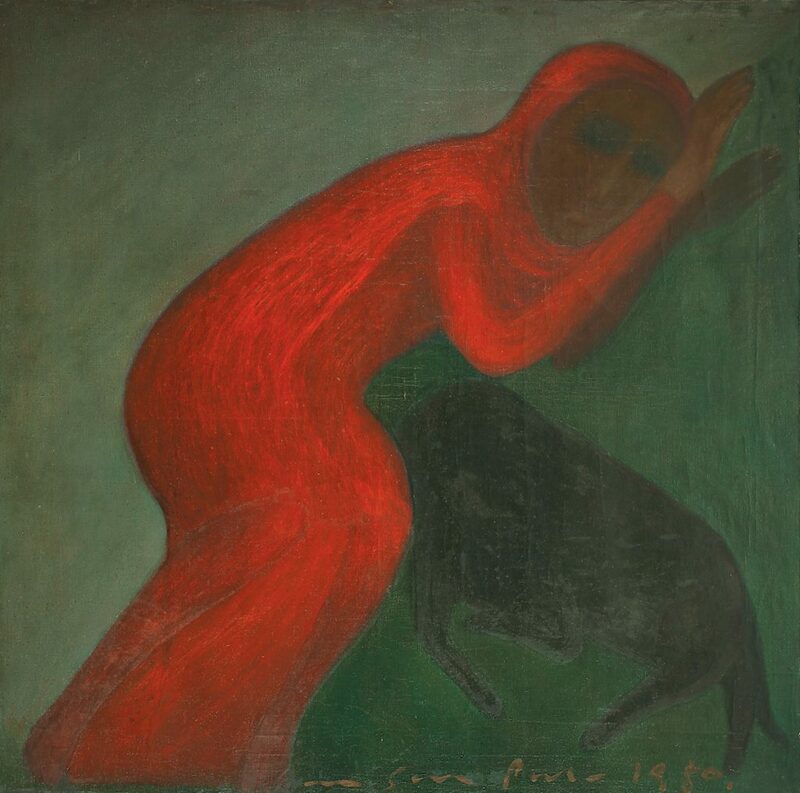 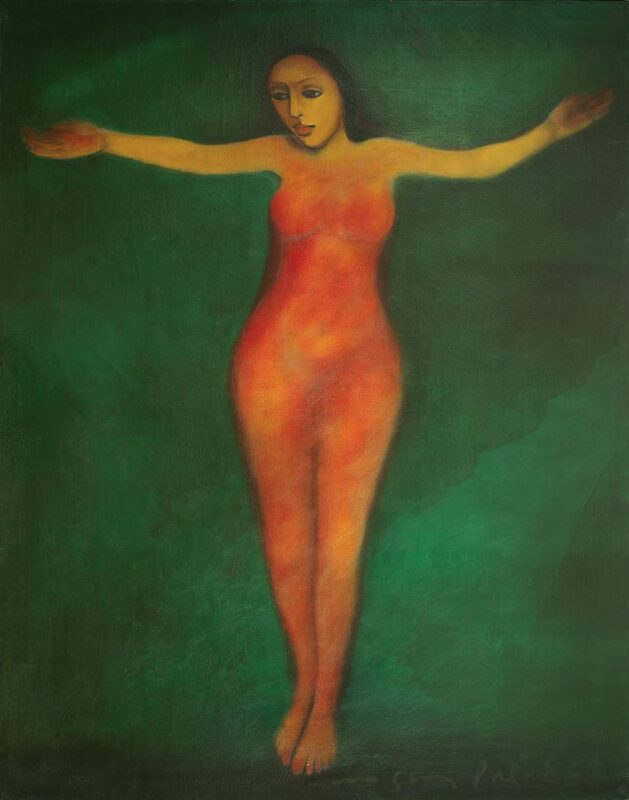 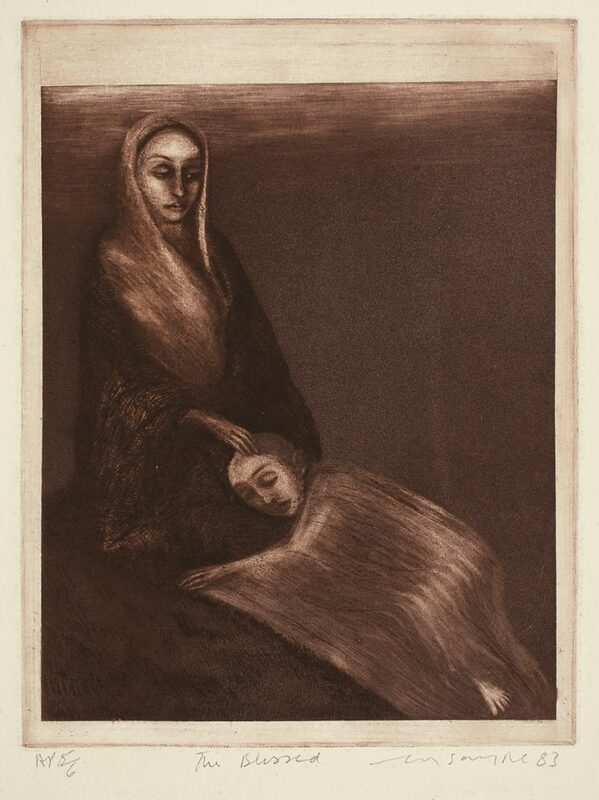 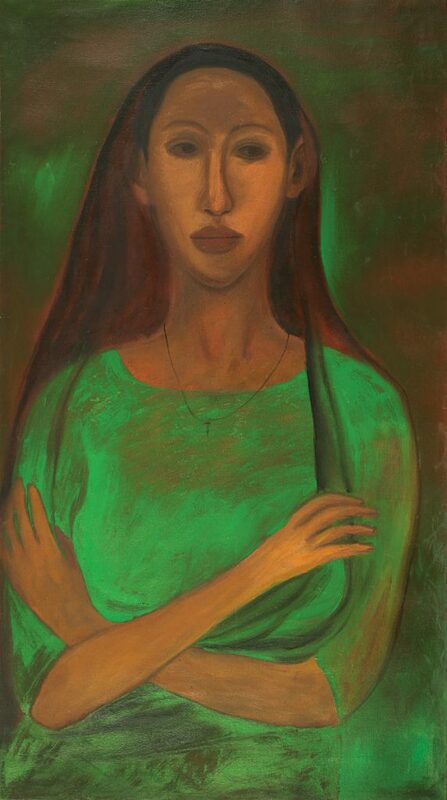 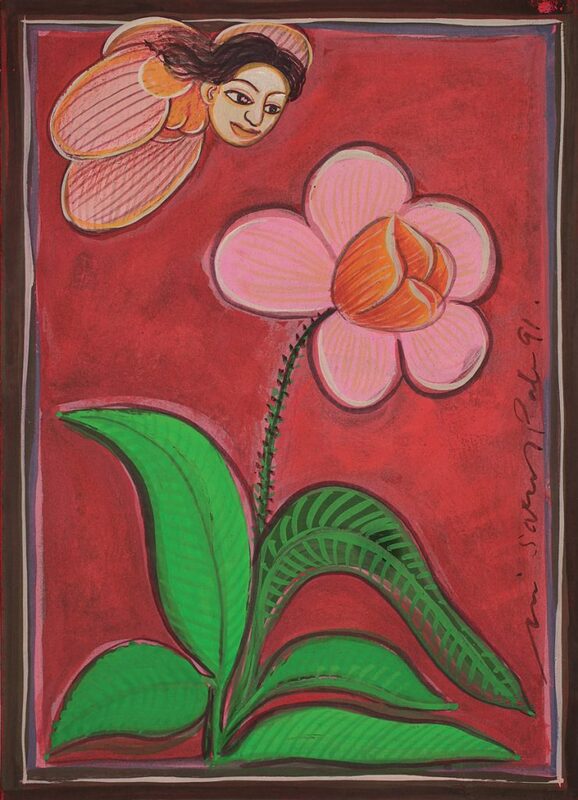 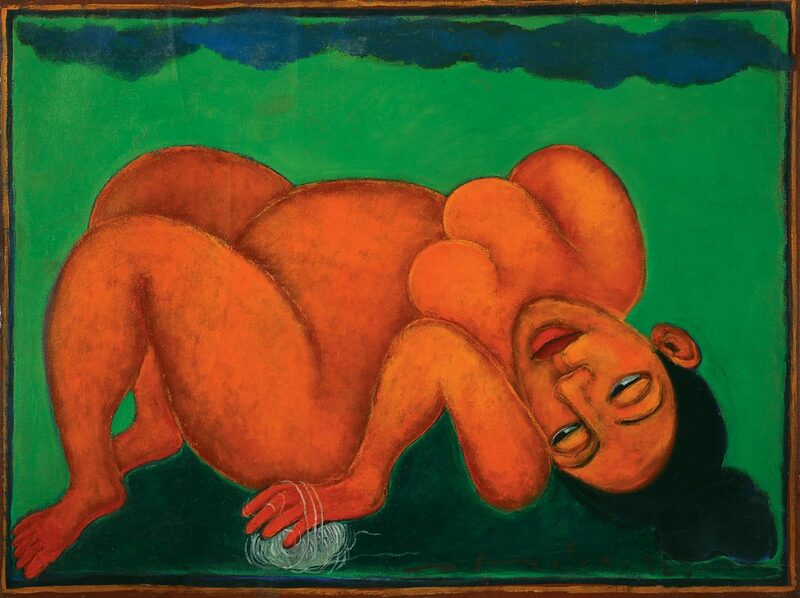 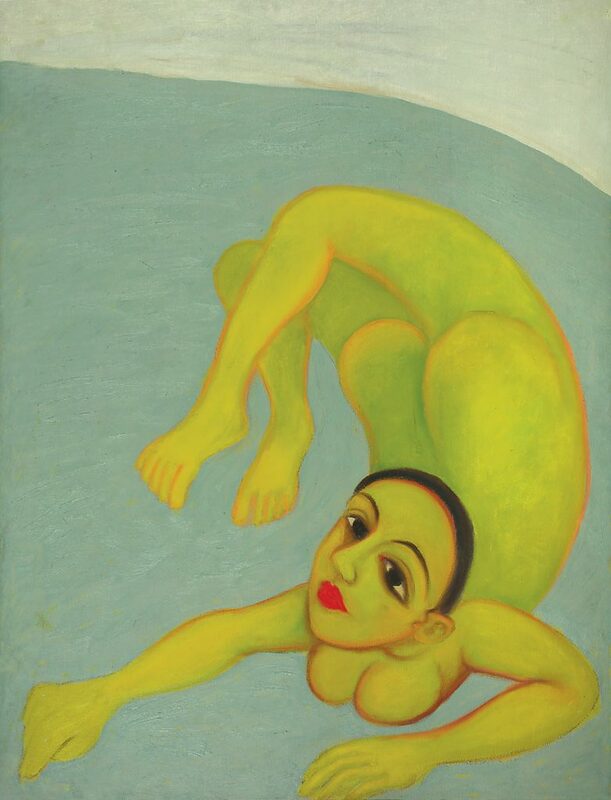 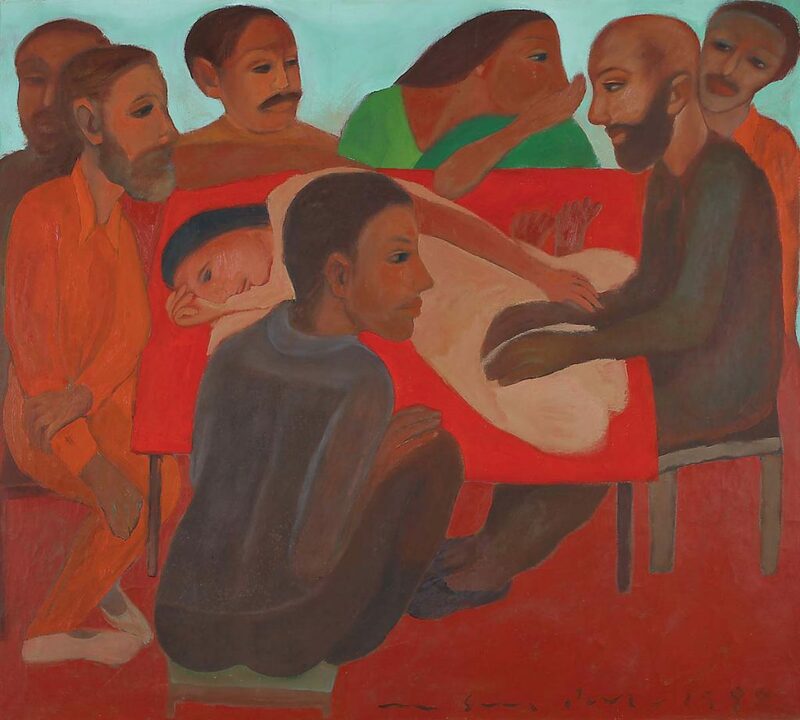 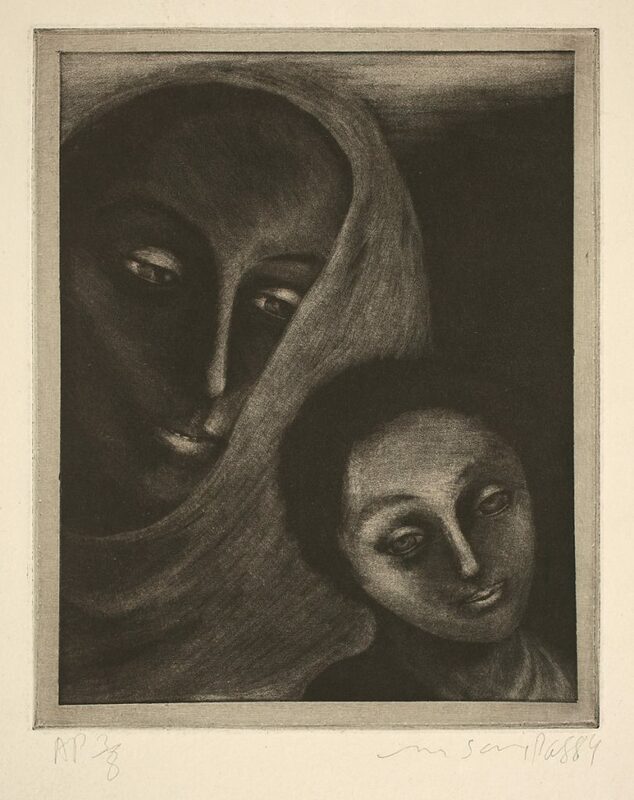 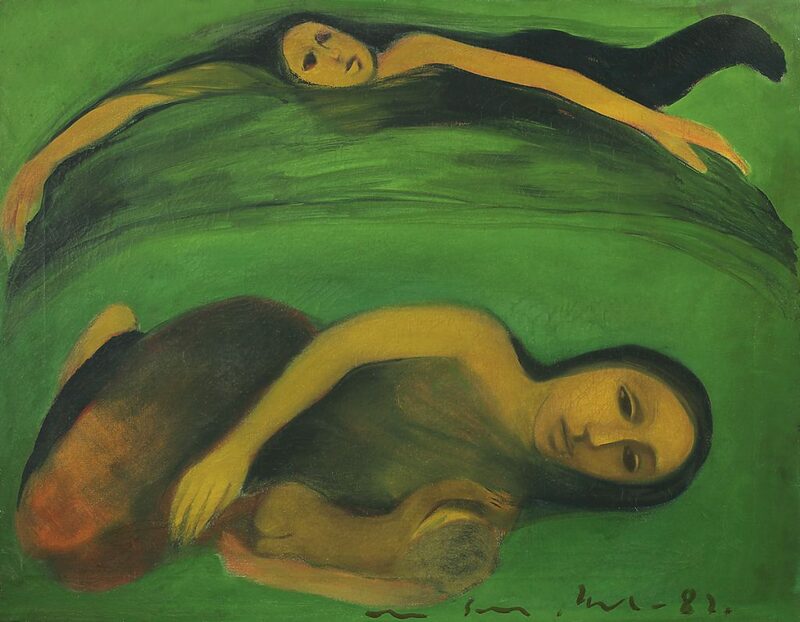 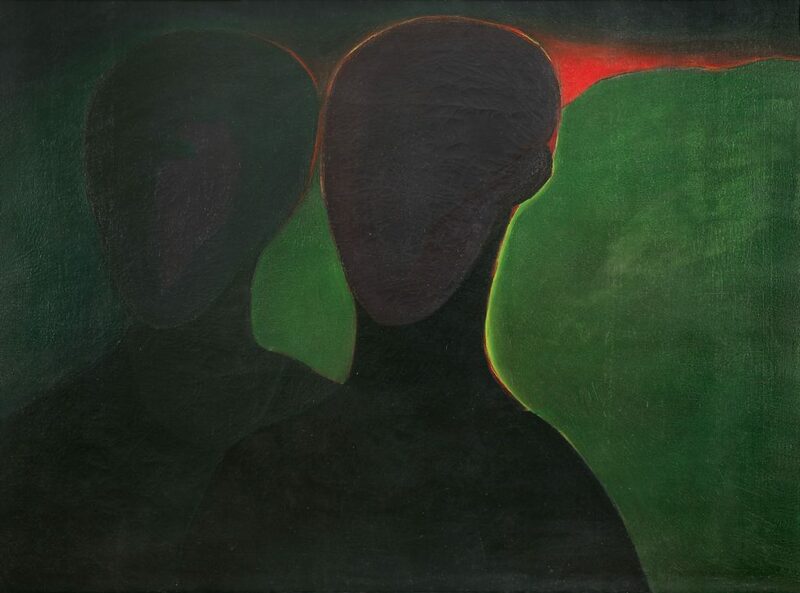 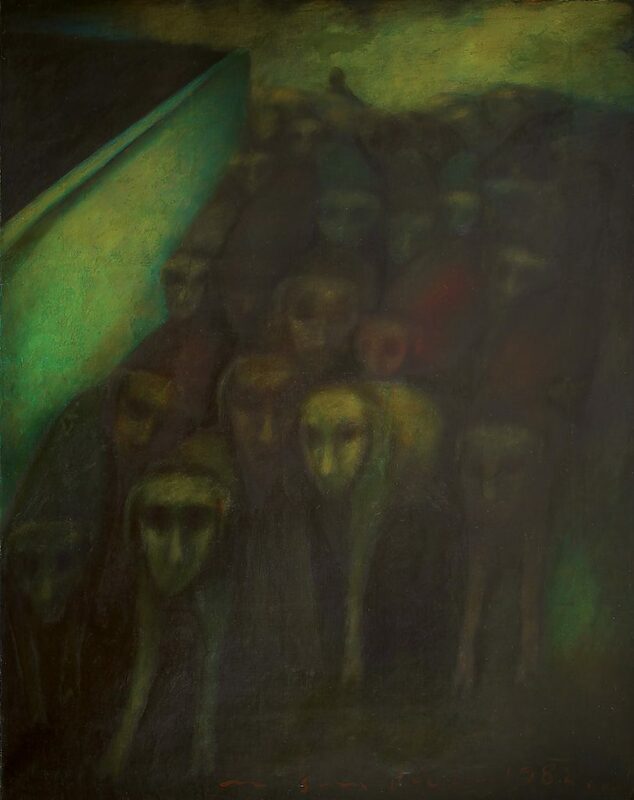 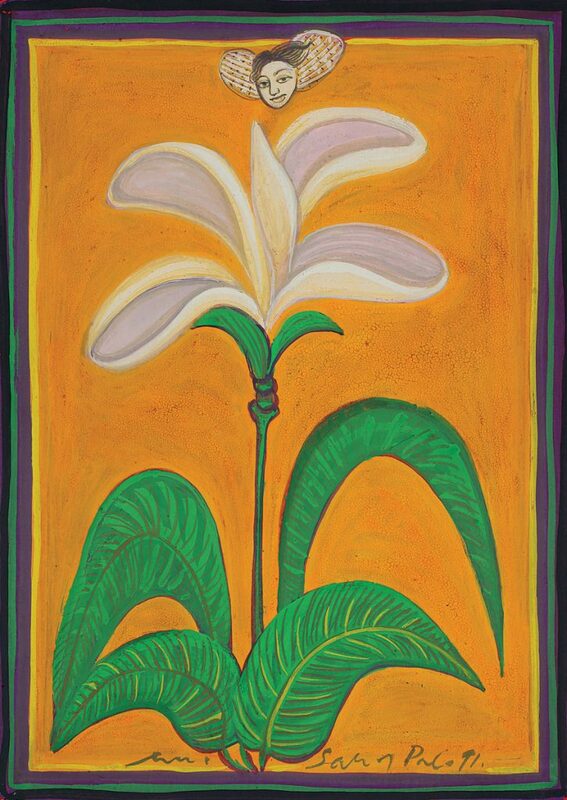 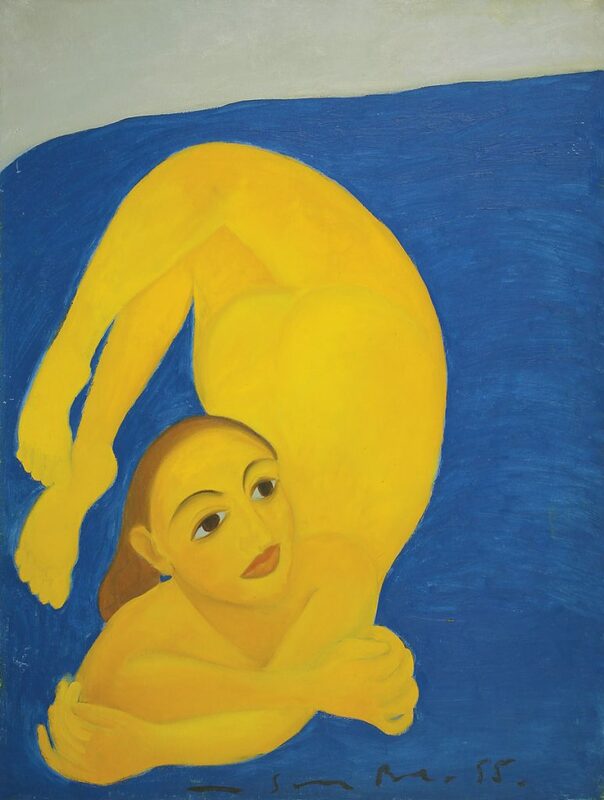 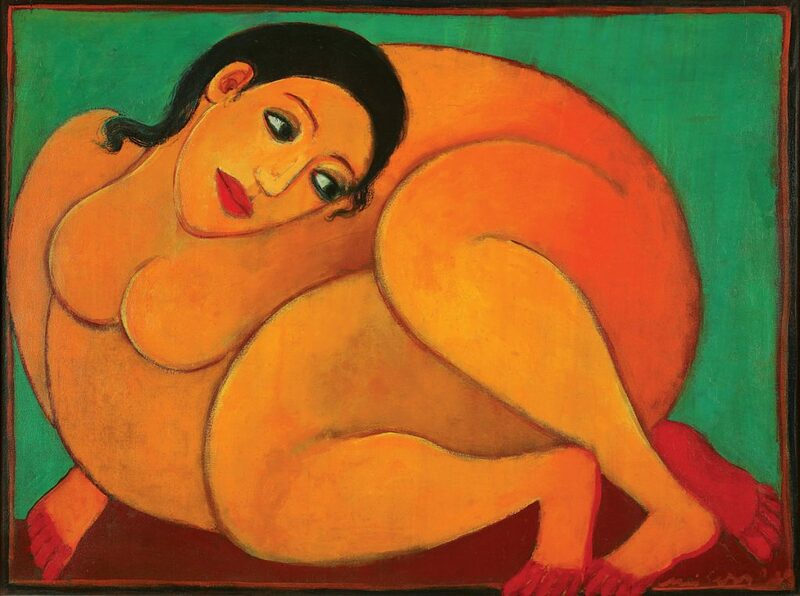 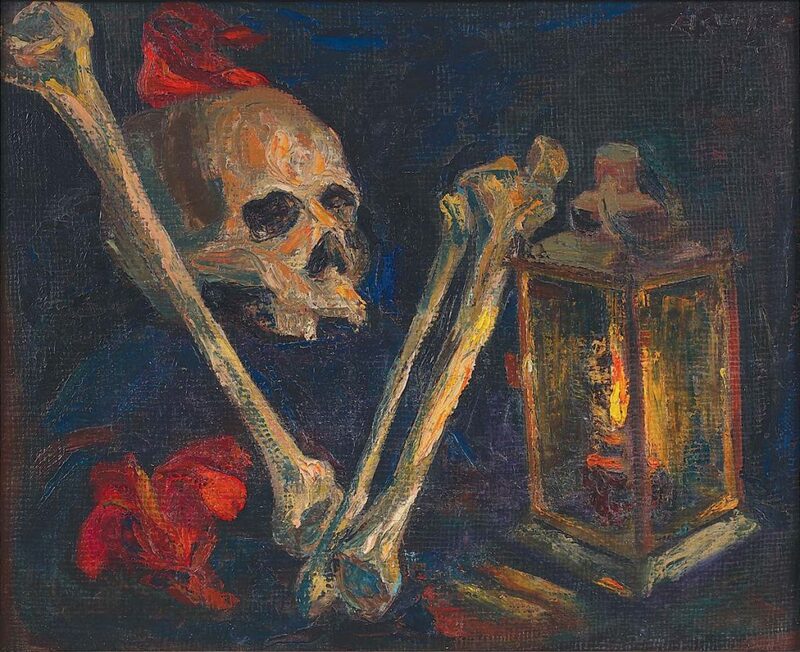 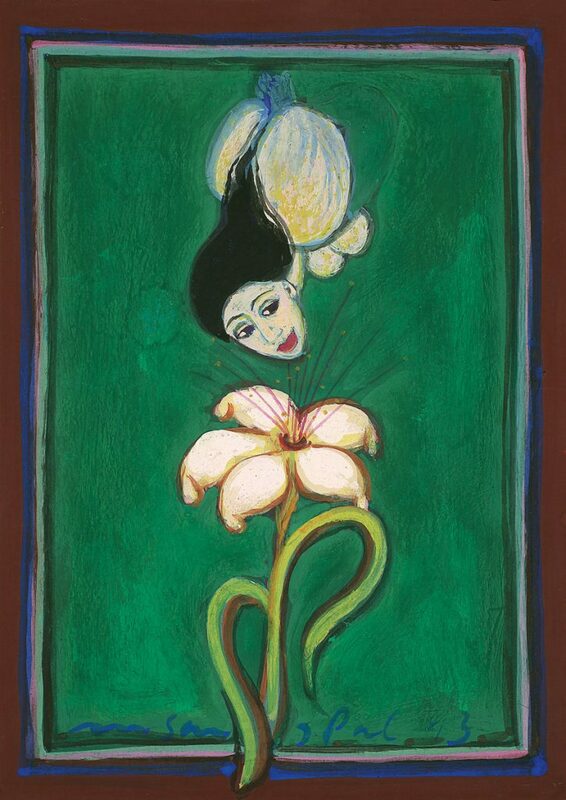 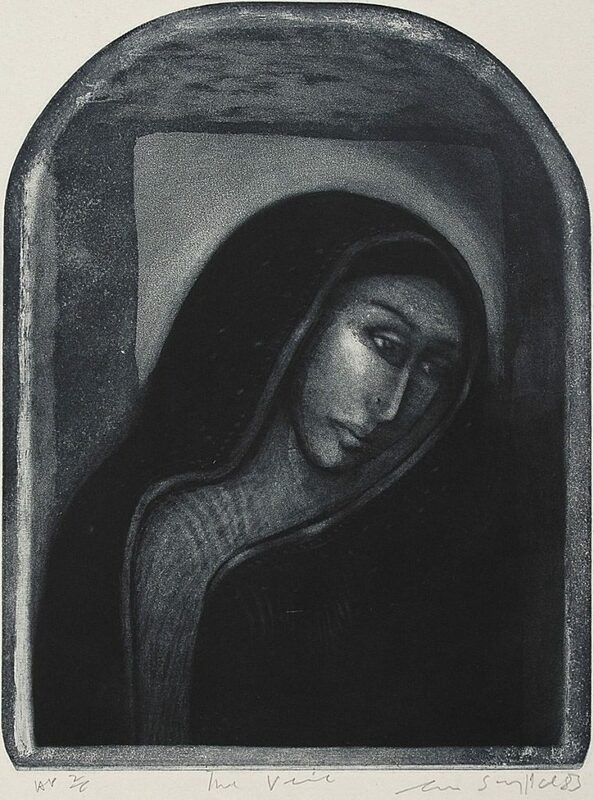 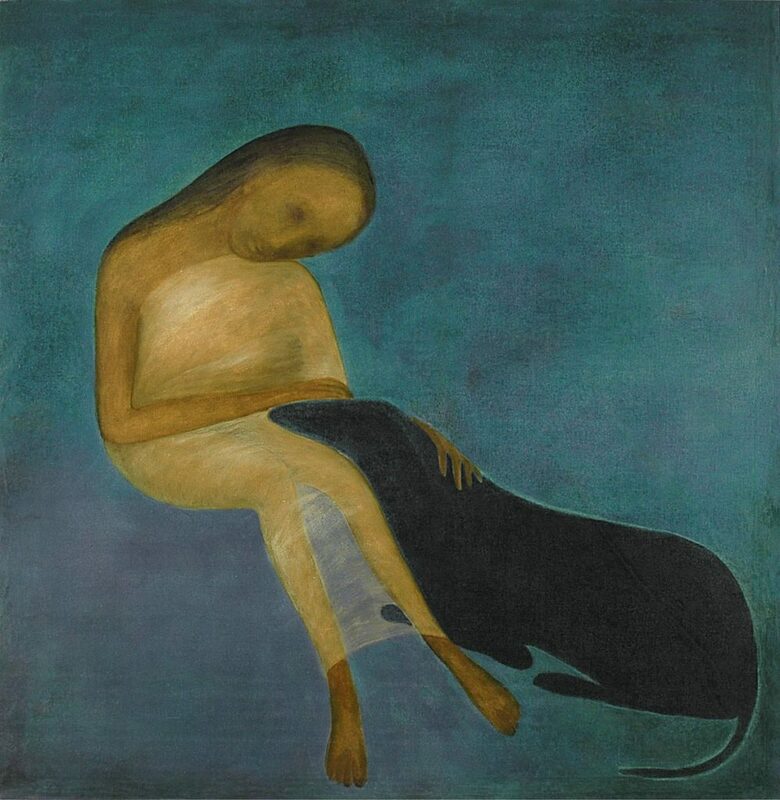 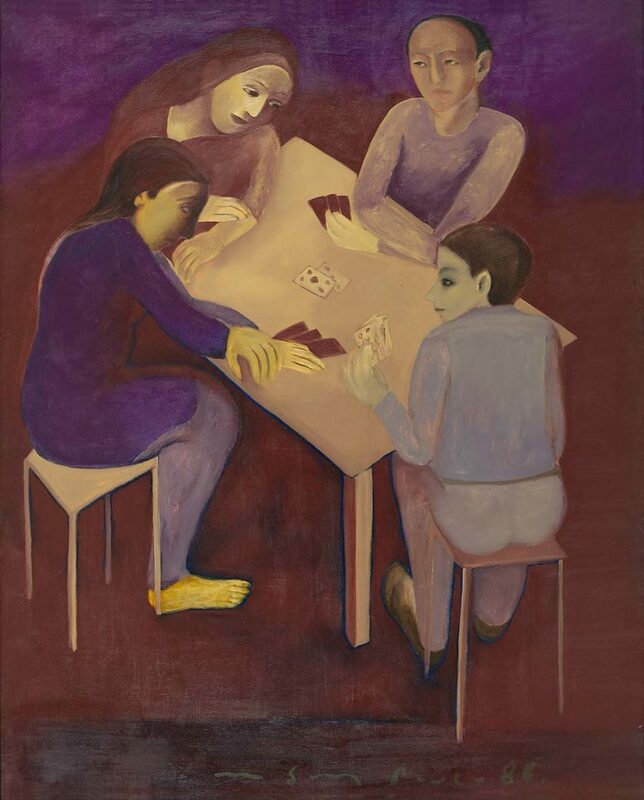 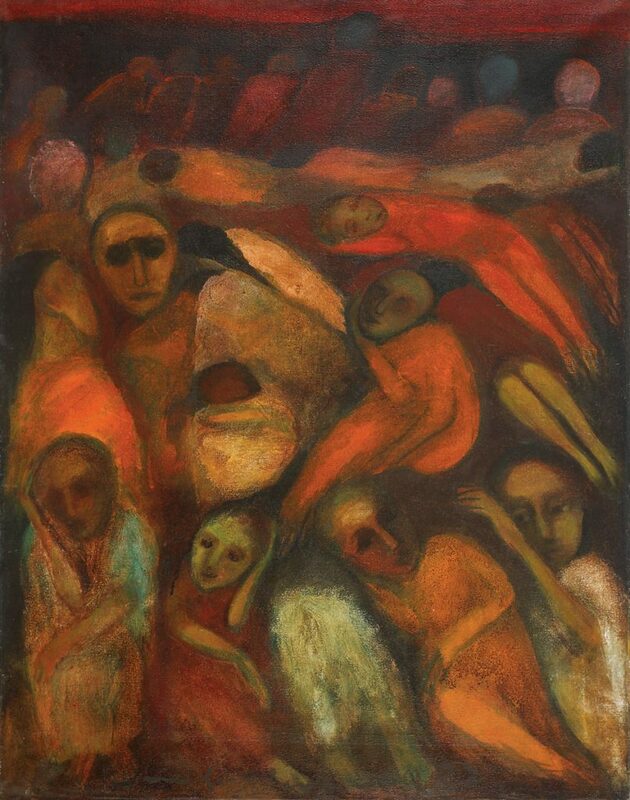 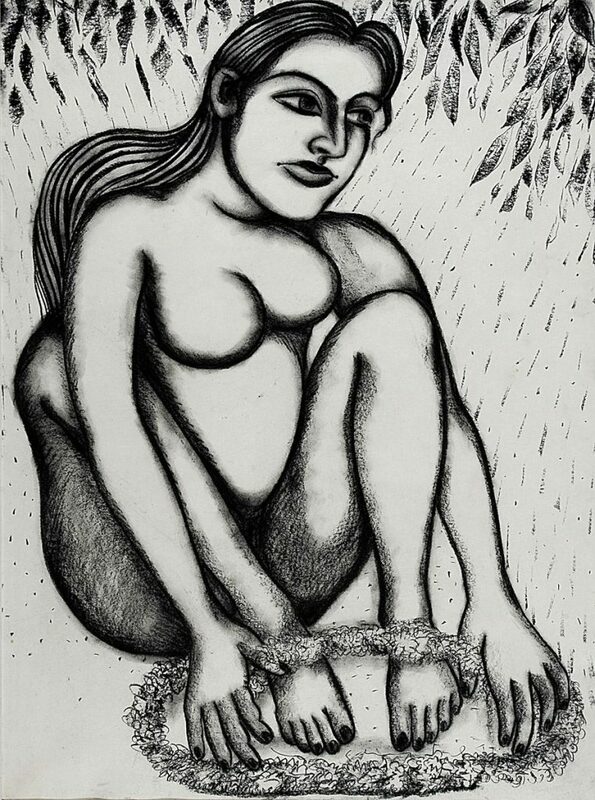 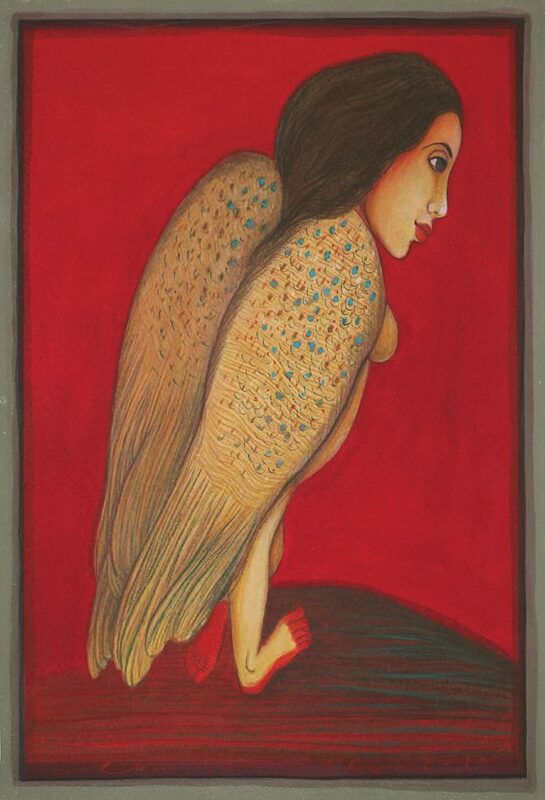 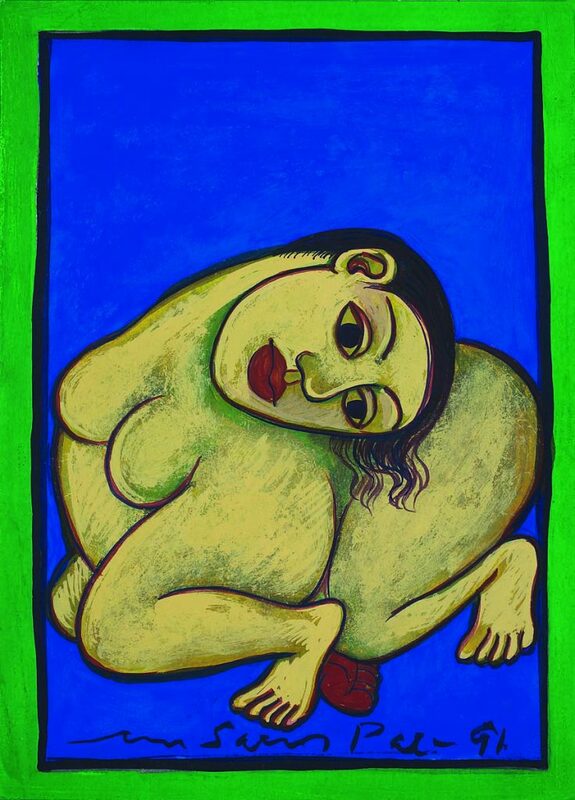 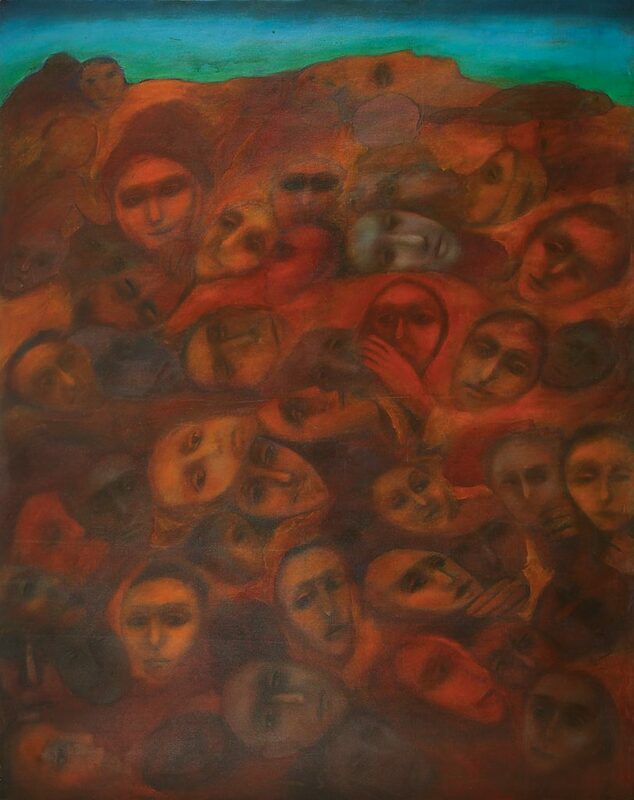 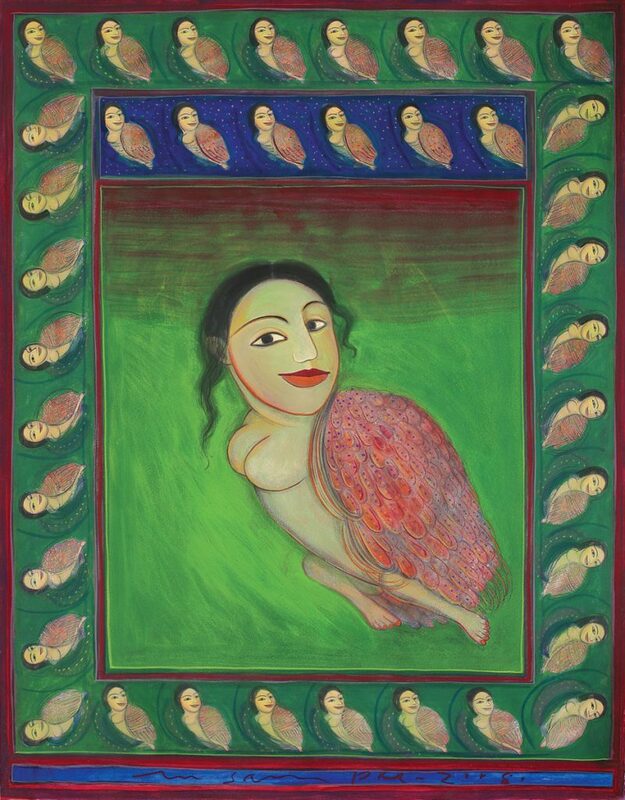 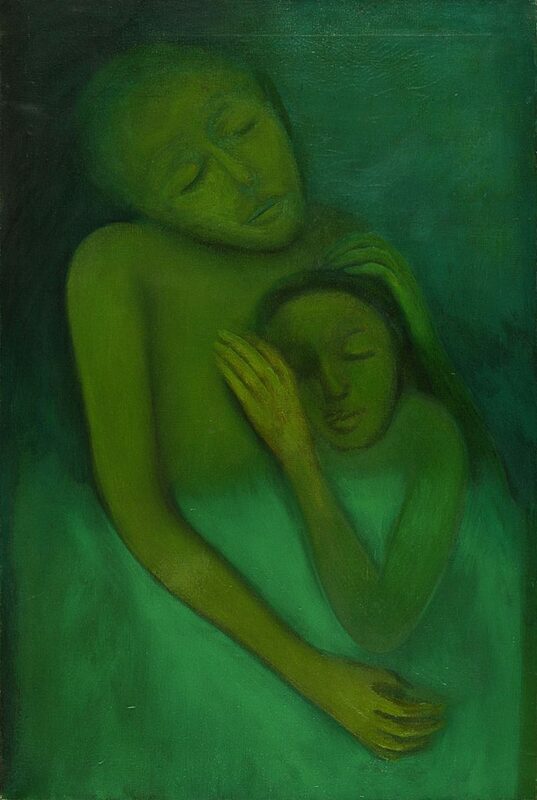 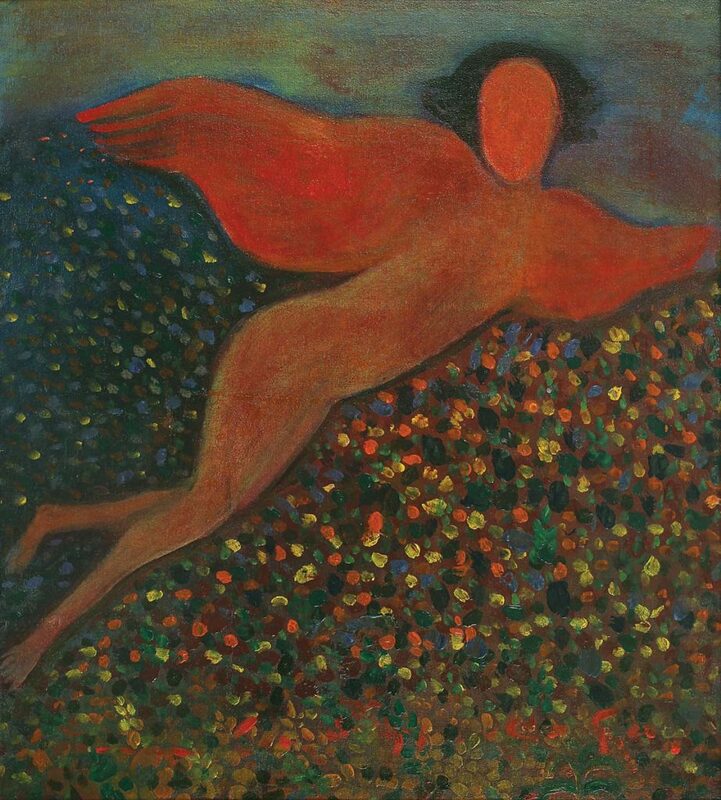 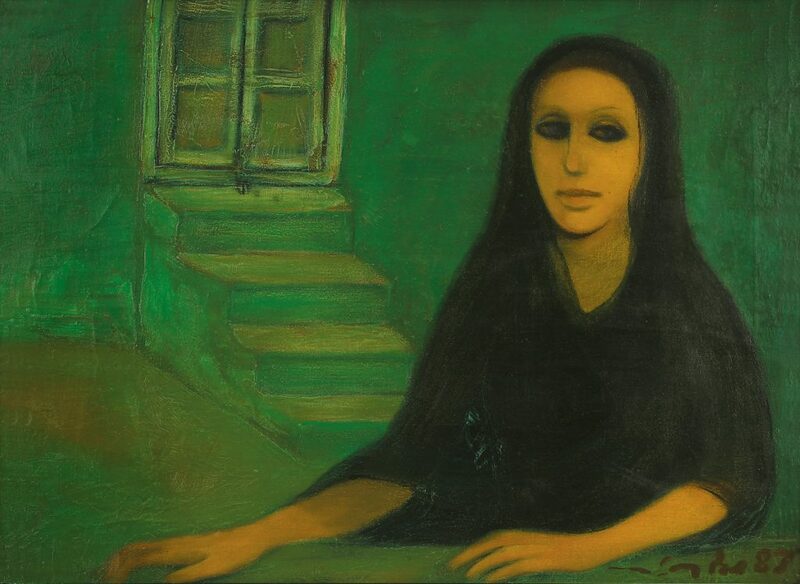 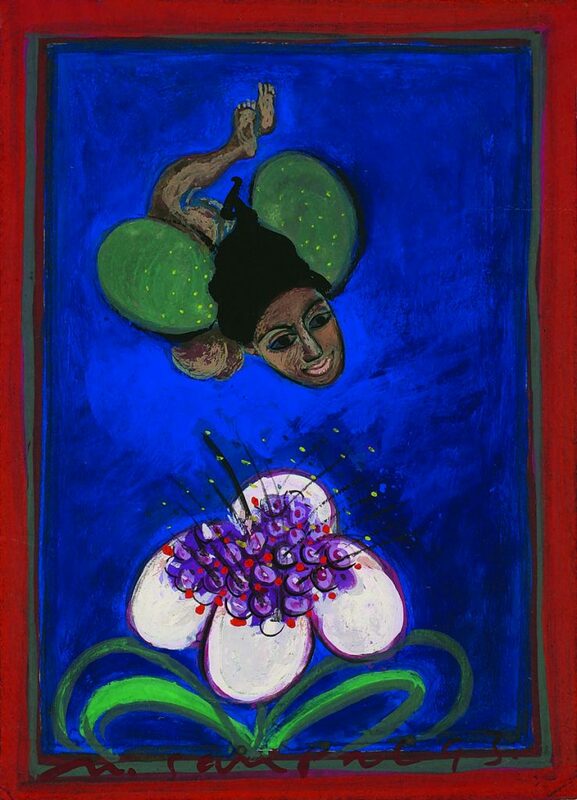 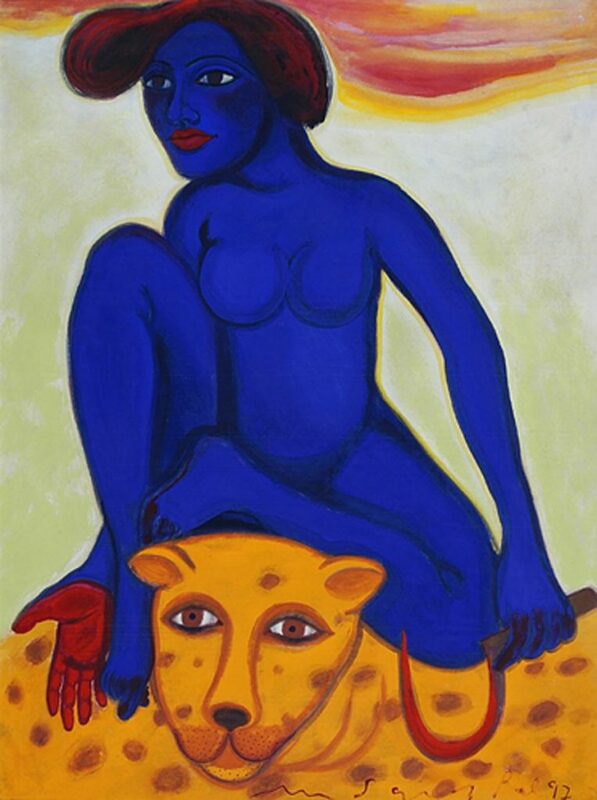 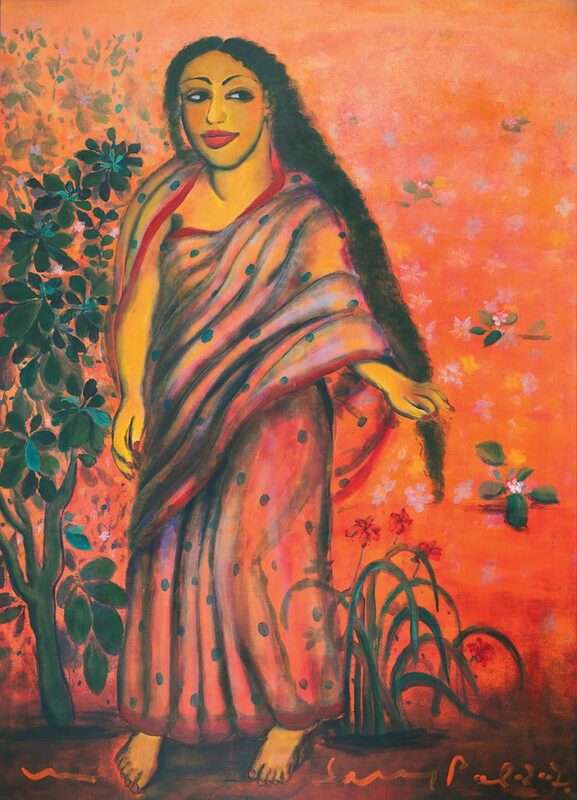 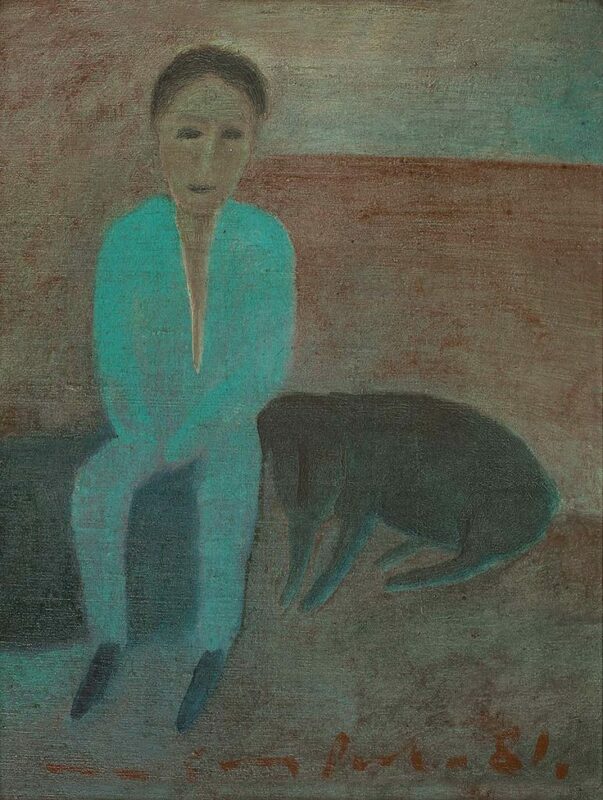 Gogi Saroj Pal, seen often as one of the first ‘feminist’ women painters in modern Indian art, has consistently explored the condition and inner life of women. 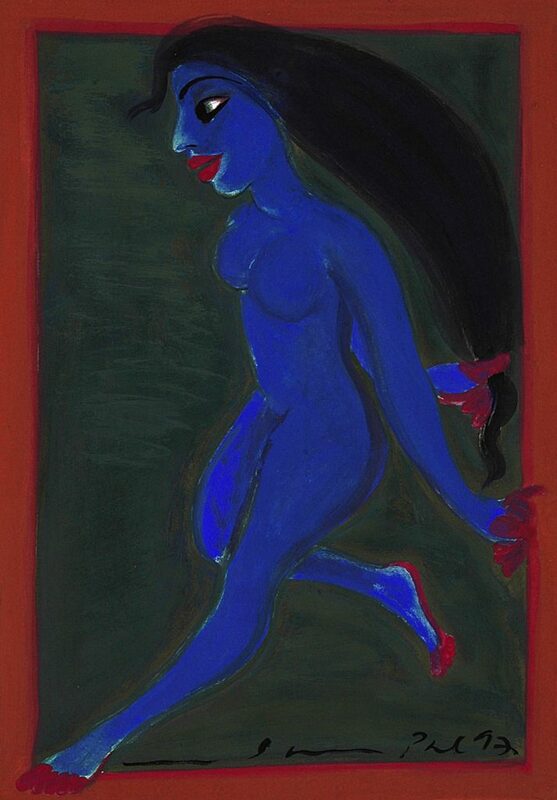 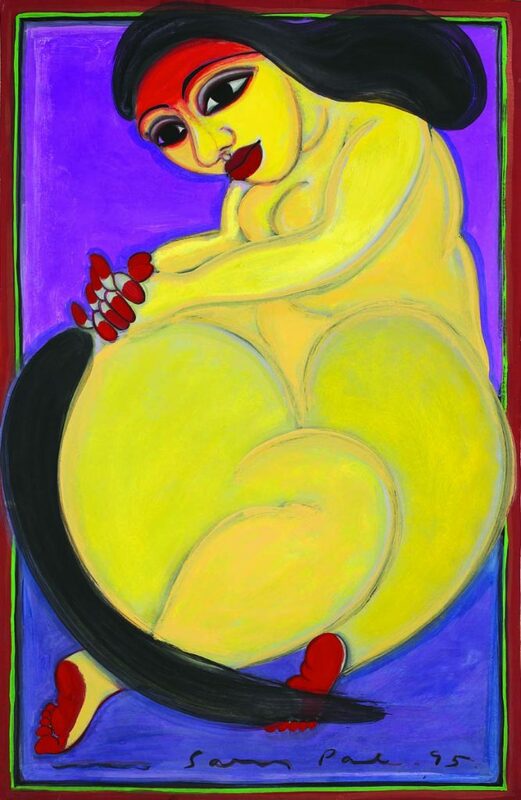 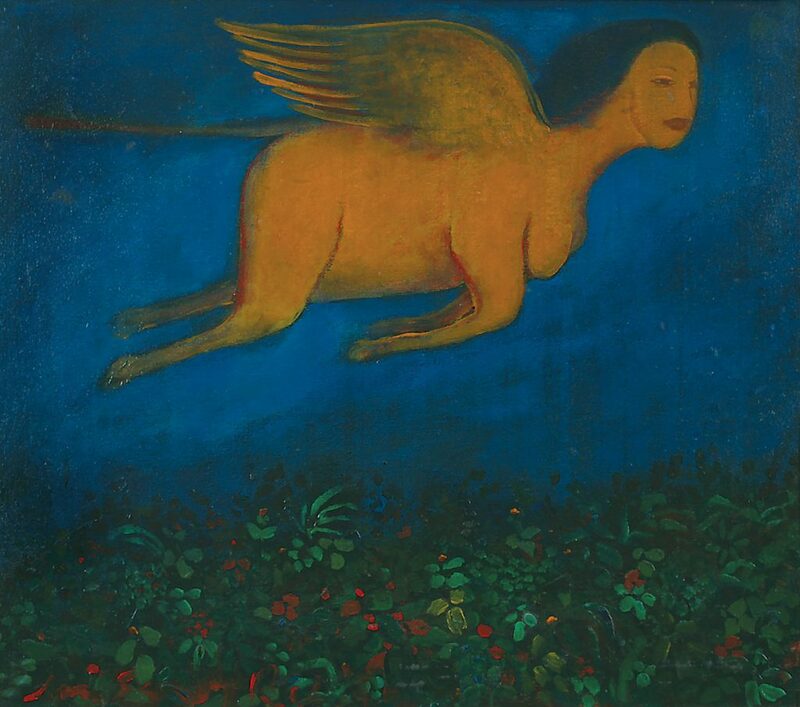 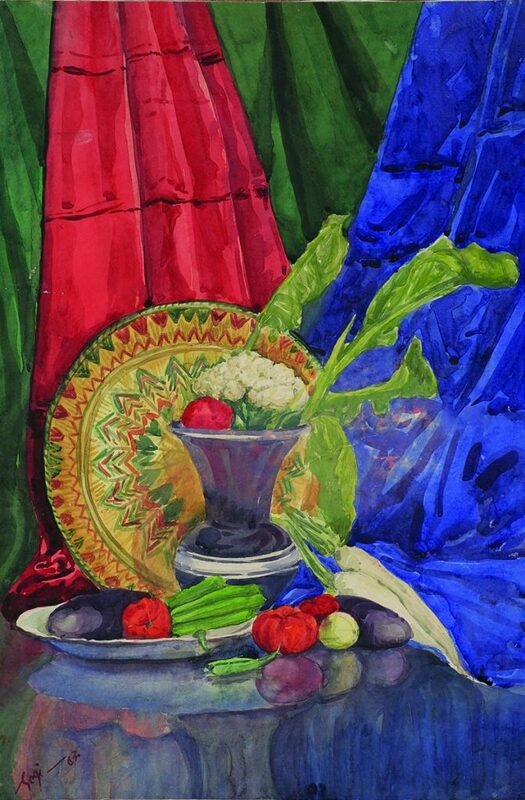 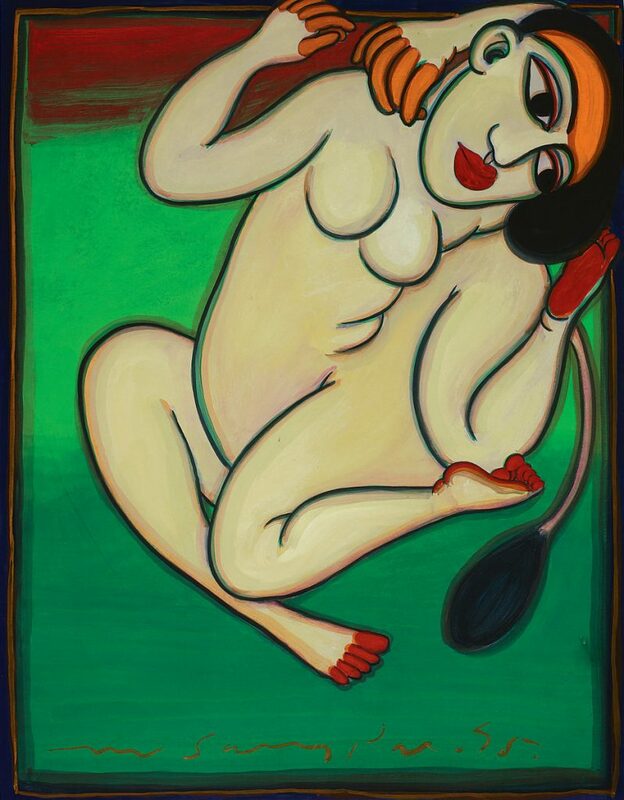 Women’s lives, their desires and compulsions, and the complex and magical world of the feminine have been Gogi’s frequent subjects. 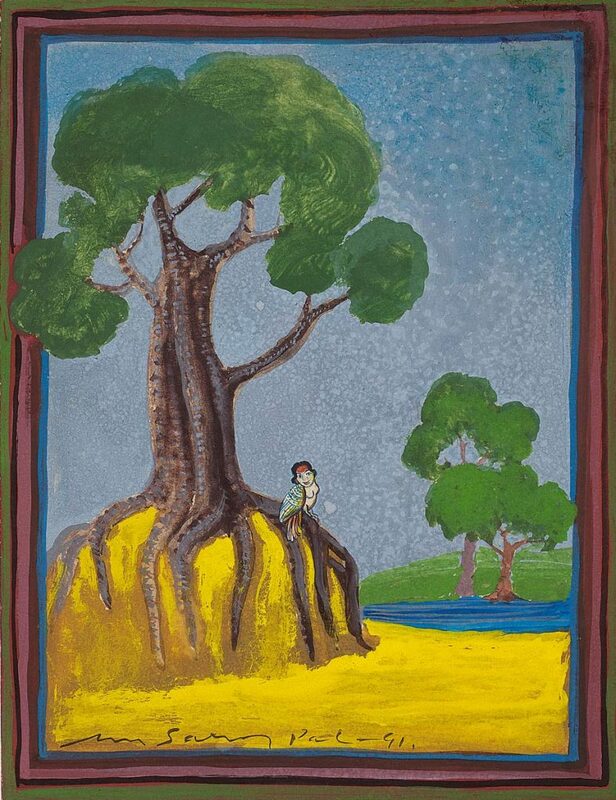 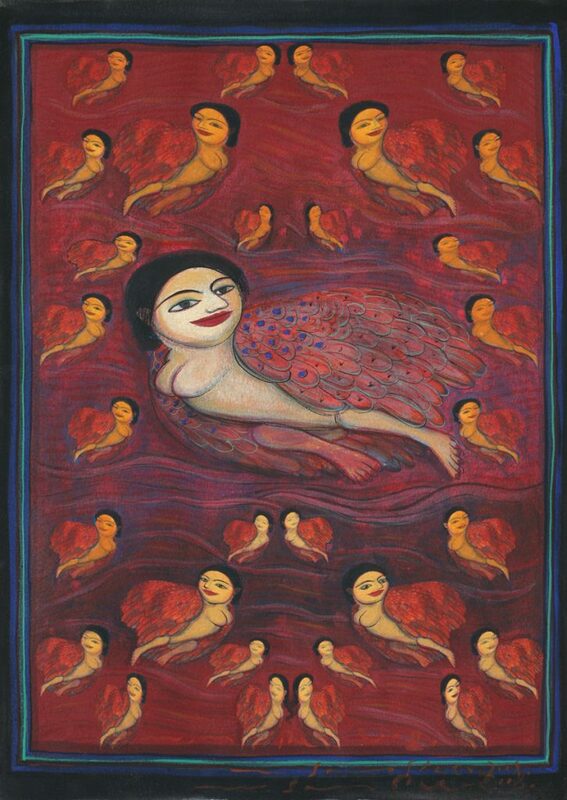 In her work, Gogi explores and responds to the vast reserve of myths, fables and lore that abound in India, interested in excavating in particular, its religious and literary traditions. 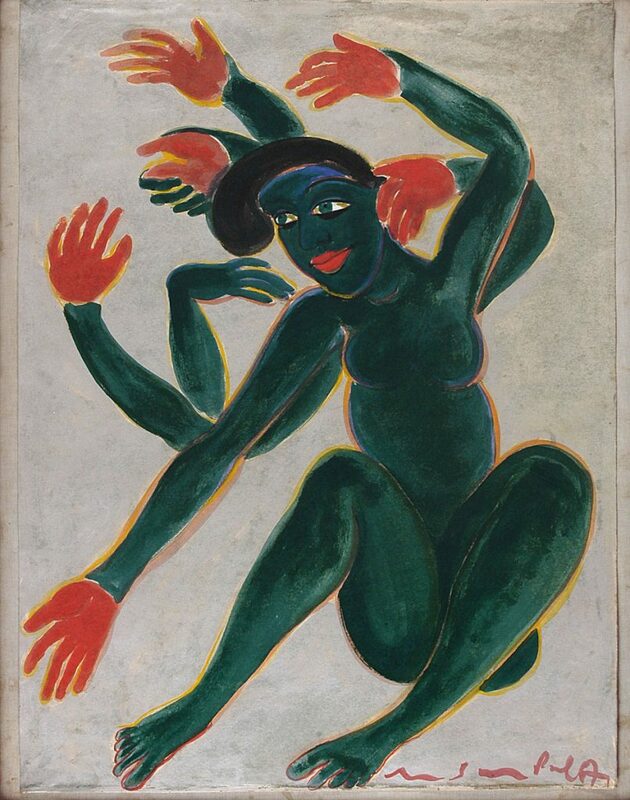 She traces and frequently creates new mythical/celestial female beings of great strength and potency, such as the Hathyogini-Kali – skilled yoga practitioner and potent female force— who assert themselves in a modern landscape where women are frequently denied agency. 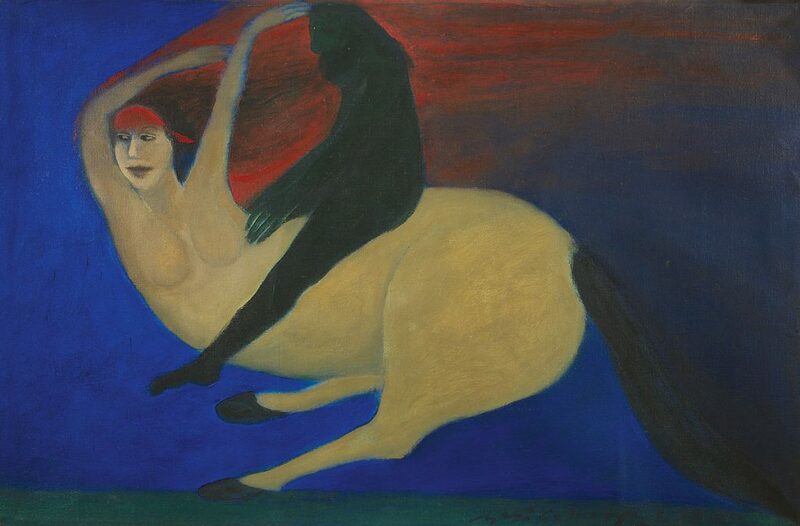 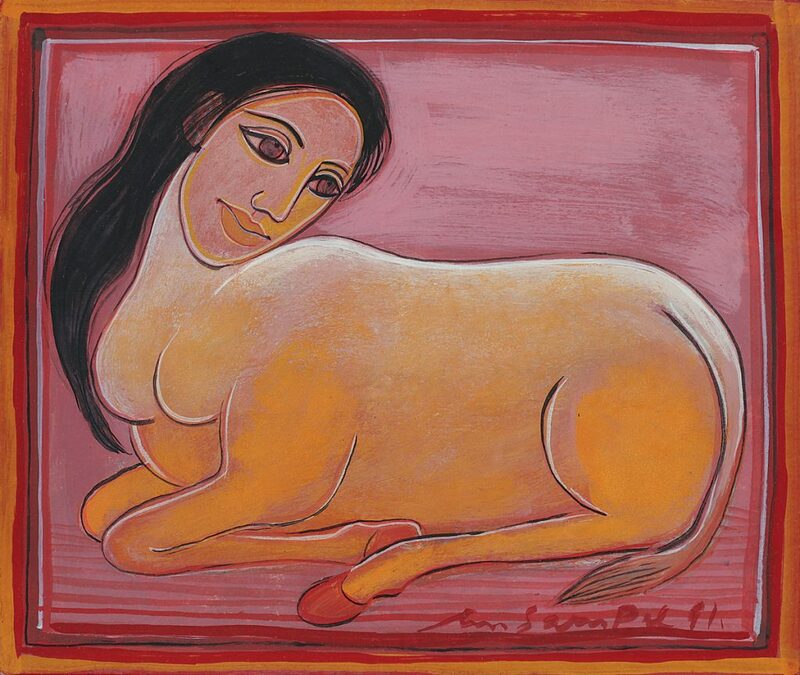 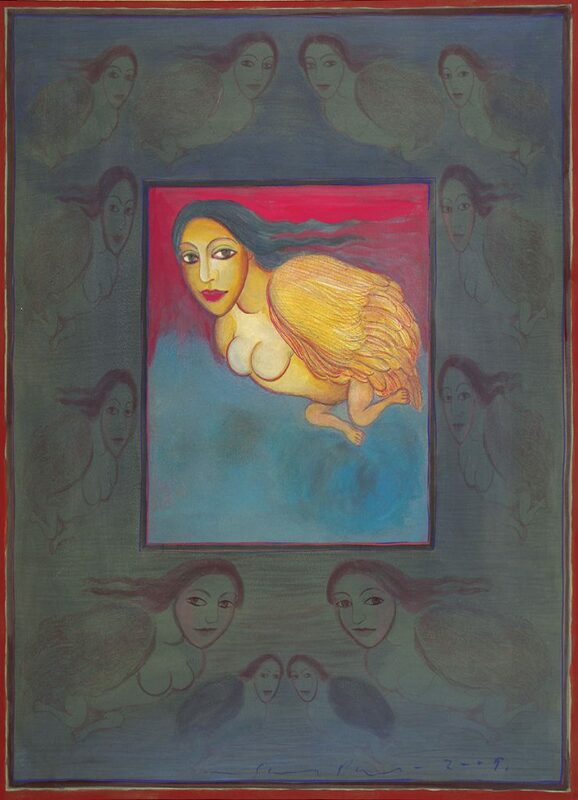 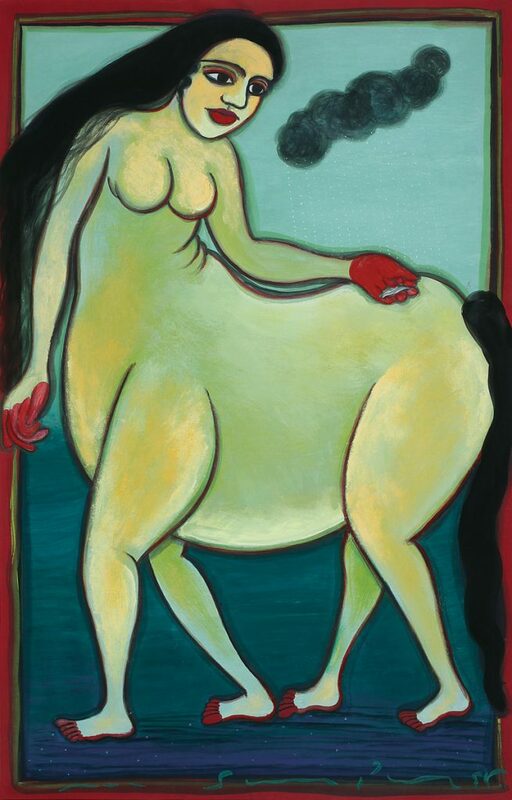 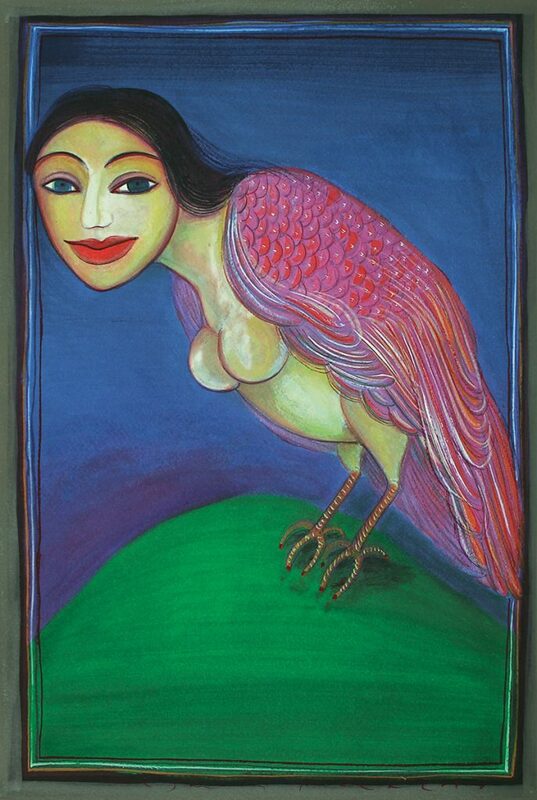 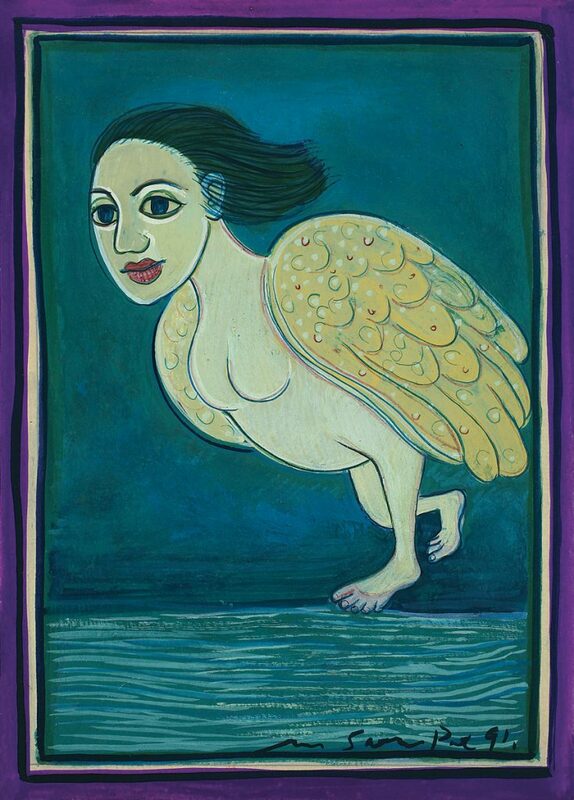 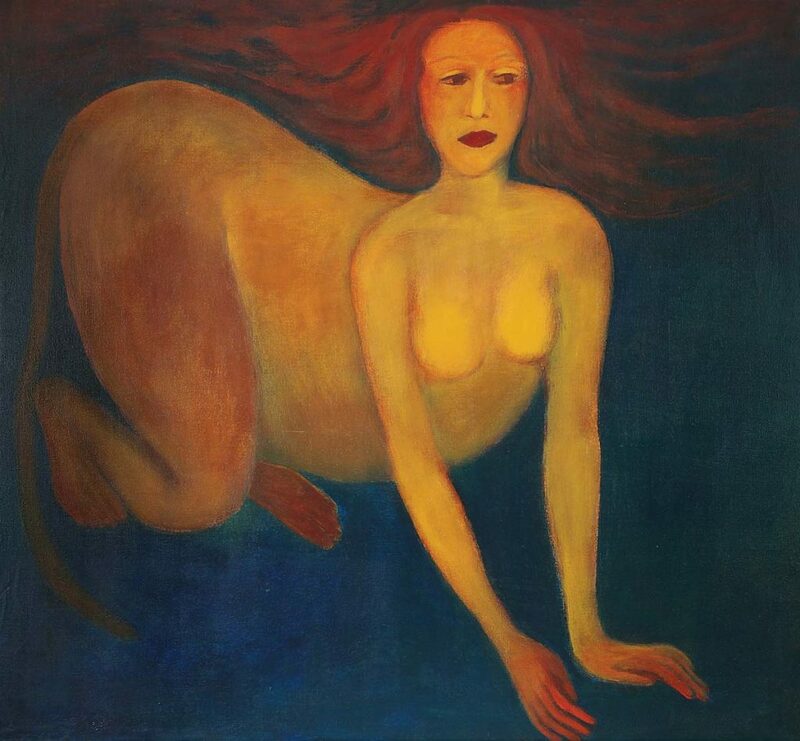 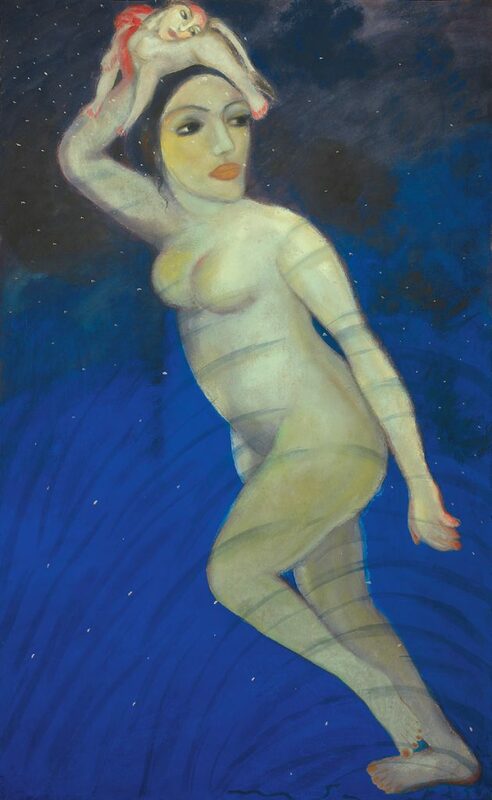 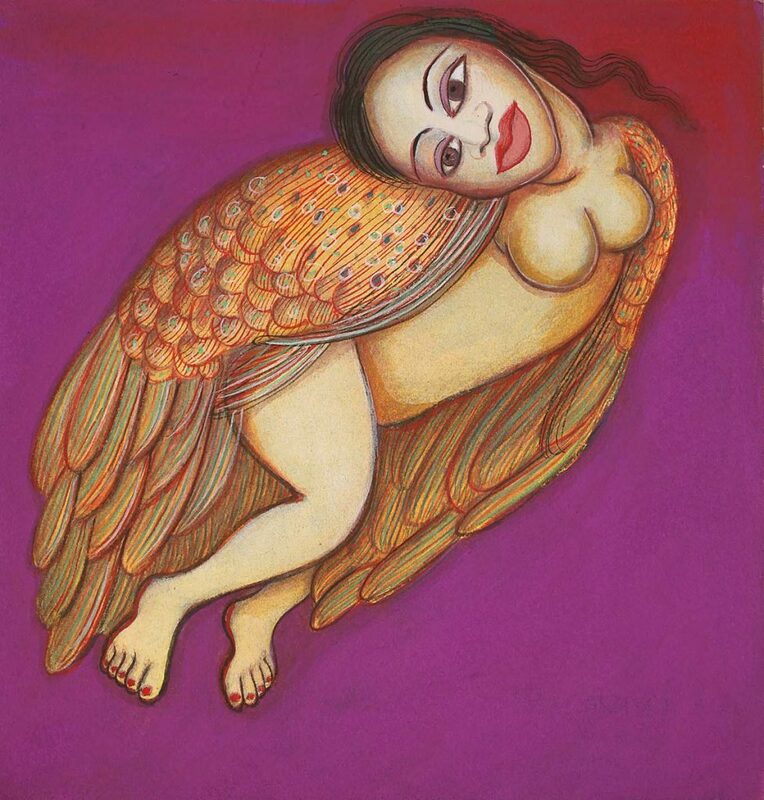 The exhibition showcased Gogi Saroj Pal’s works starting from her earliest series Being a Woman and Relationship, leading to the strong body of work featuring half-human and half-animal composite beings that the artist is primarily known for, under the series Kamdhenu (half woman and cow), Kinnari (half woman and bird) and Dancing Horse (half woman and horse). 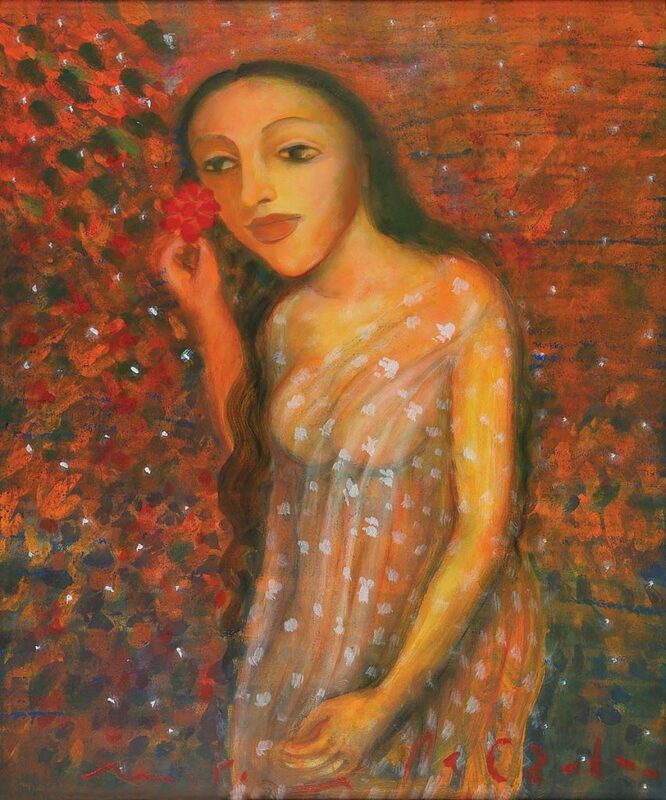 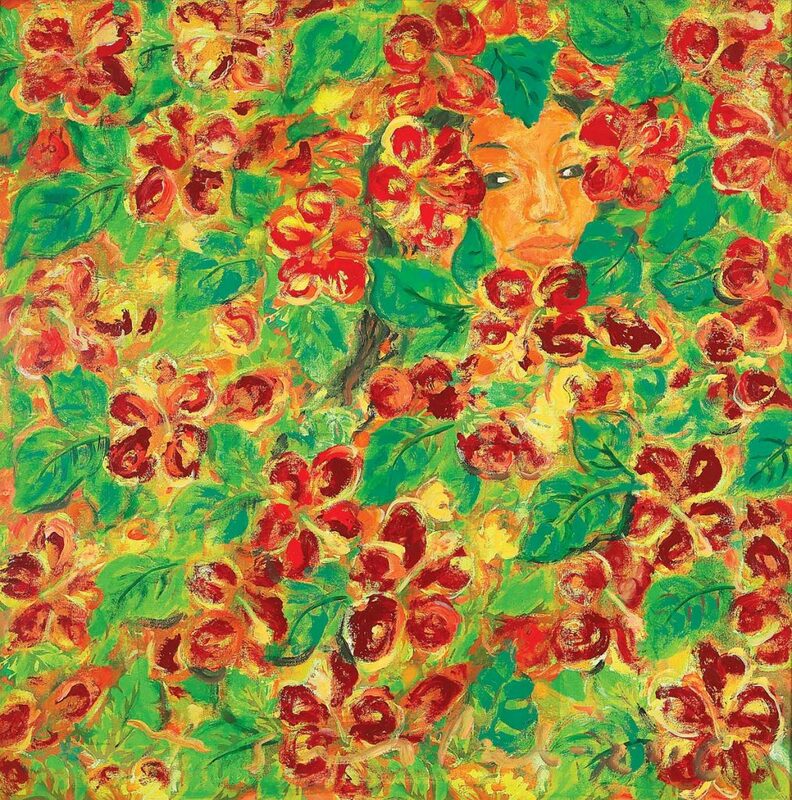 It will go on to feature her later series All These Flowers Are For You, done by Gogi in a state of convalescence where she painted female figures on fabric printed over with flowers, Young Monks, inspired by the solitary life of monks, and Aag ka Dariya (river of fire) where Gogi responds scathingly and with sensitivity to the rampant practice of female foeticide. 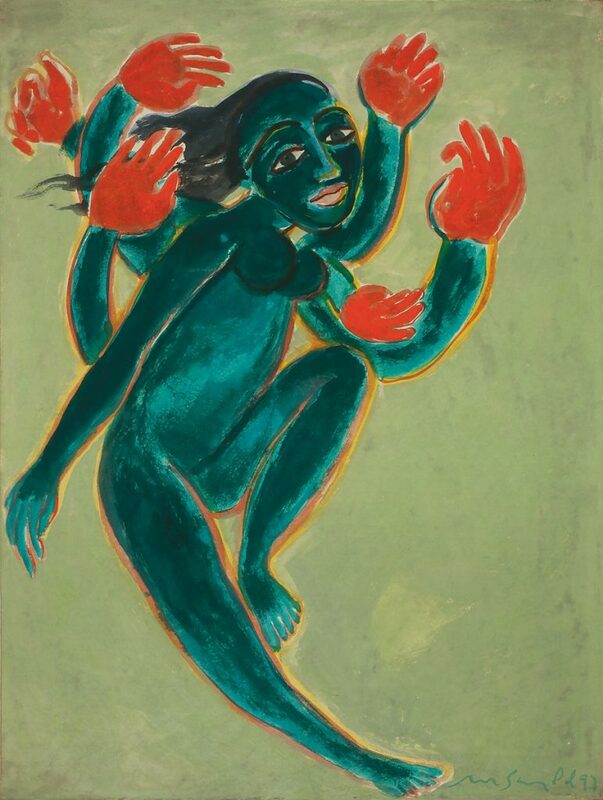 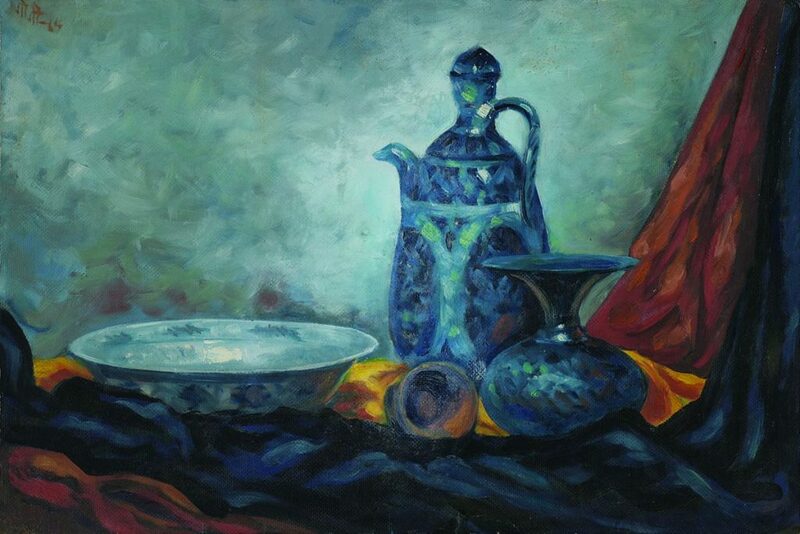 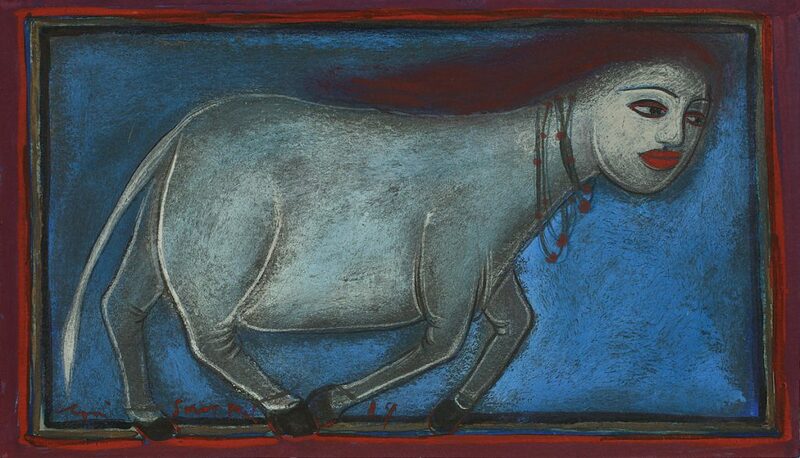 An abiding influence and source of fascination for Gogi is the miniature tradition, in particular its exploration of the nayika bhed or the heroine. 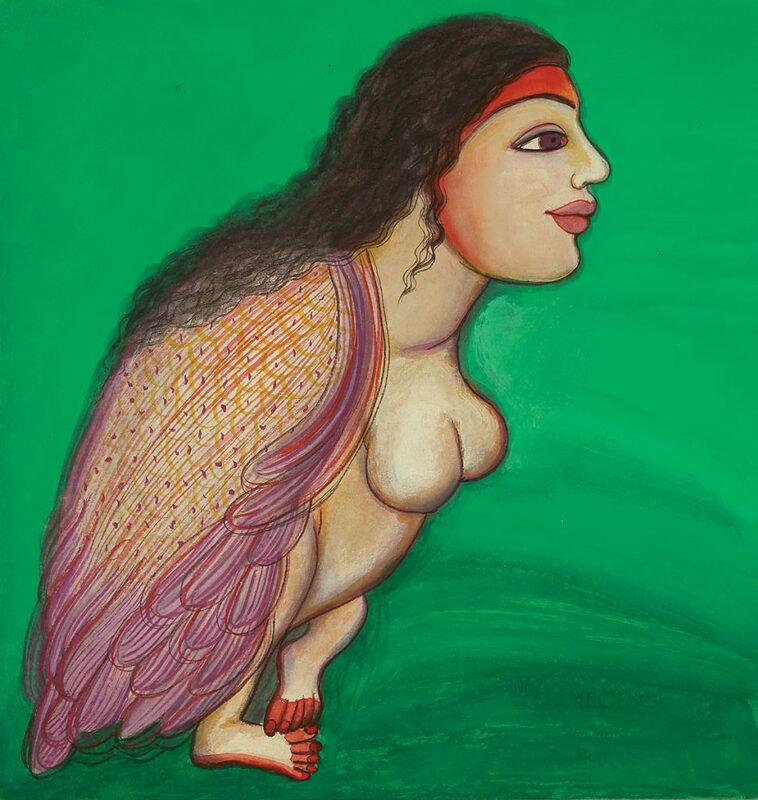 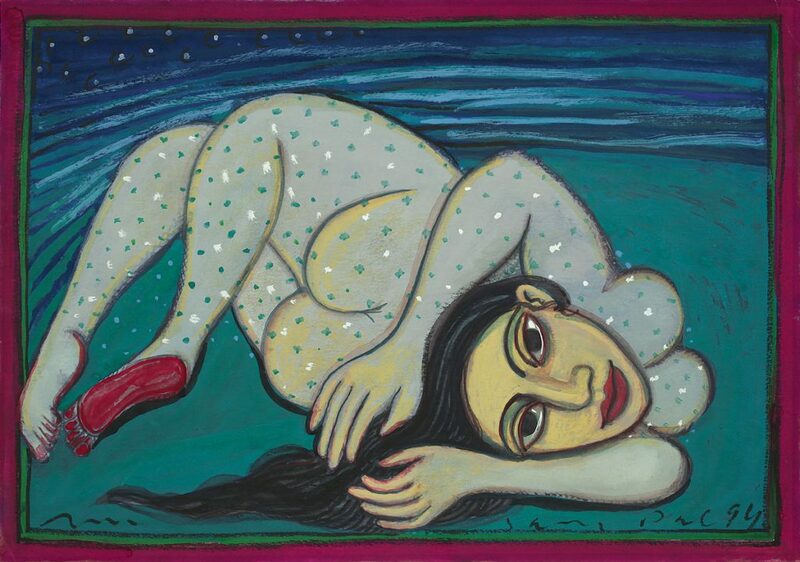 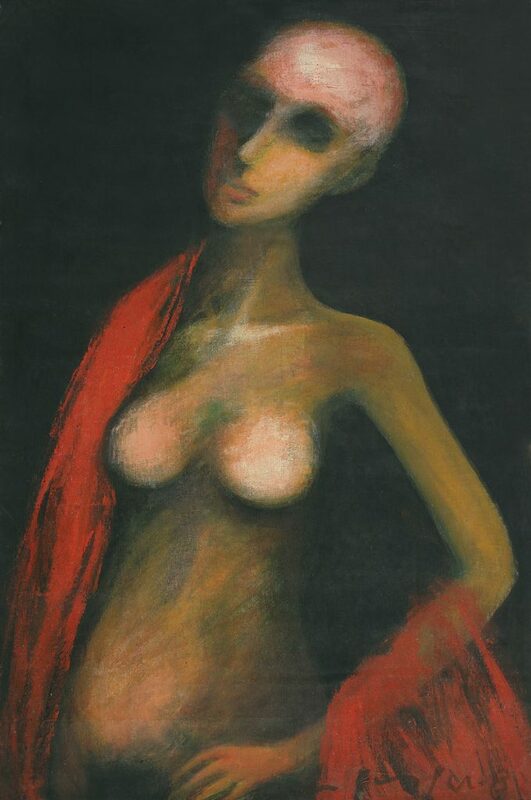 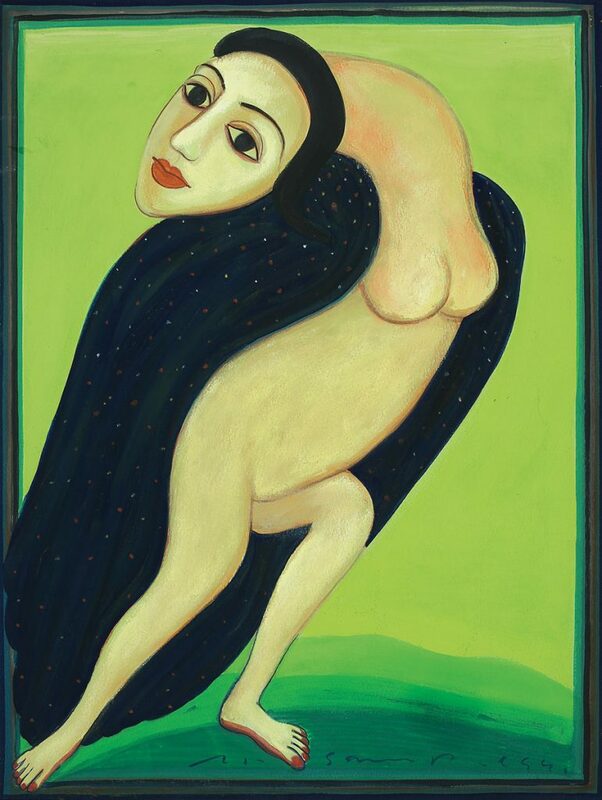 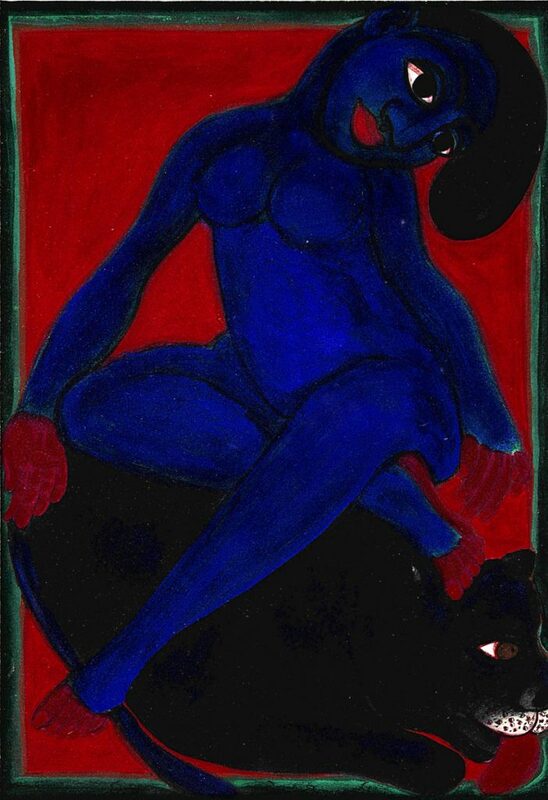 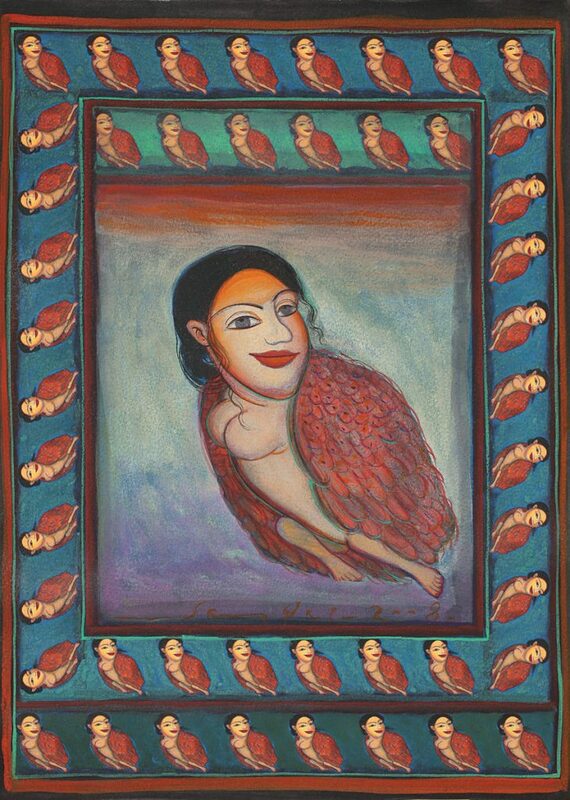 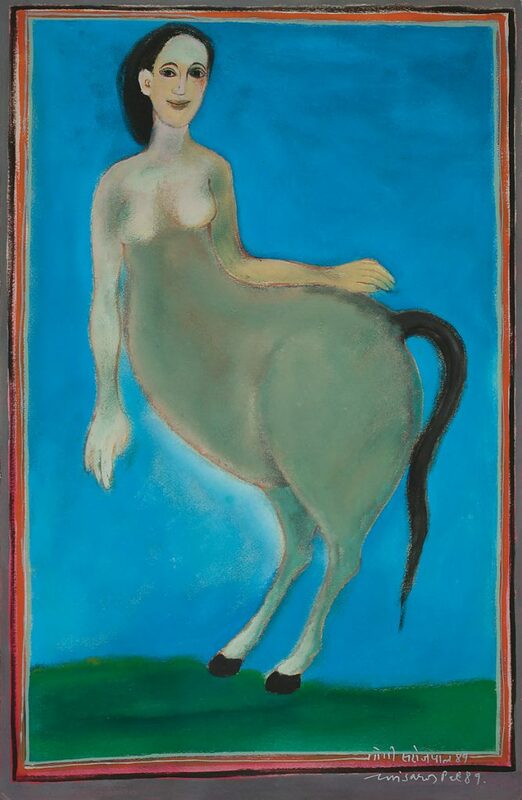 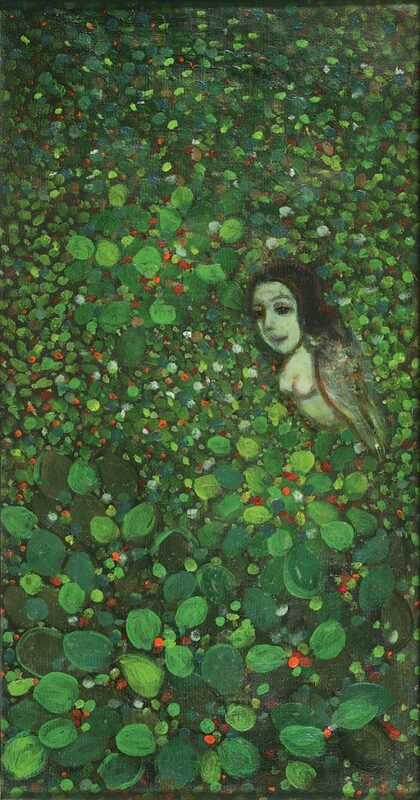 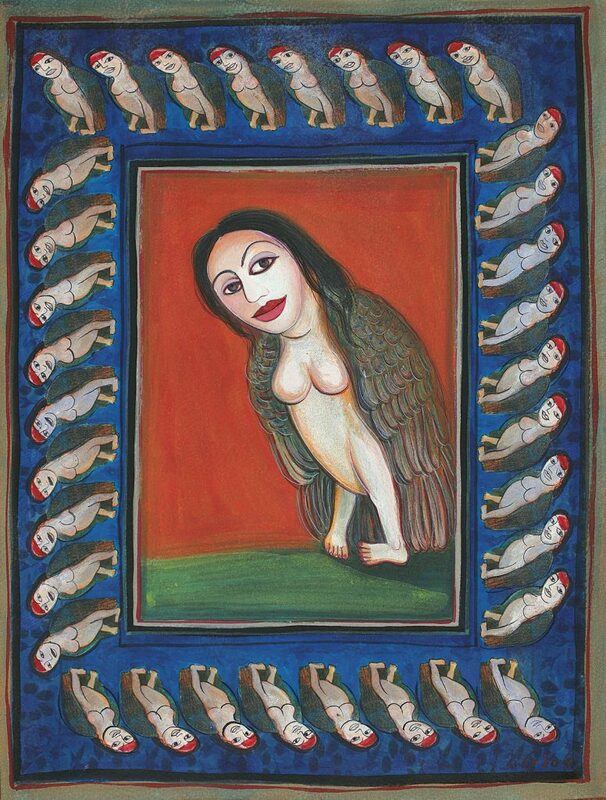 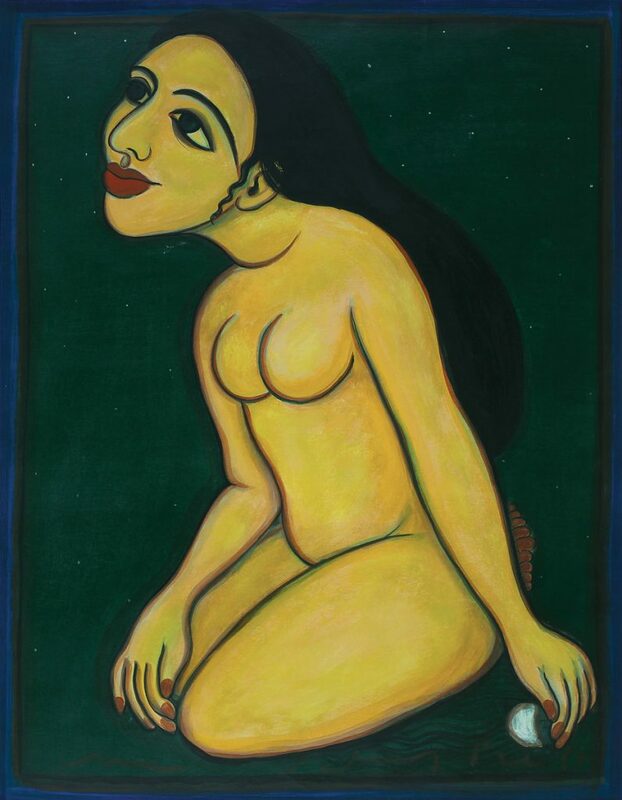 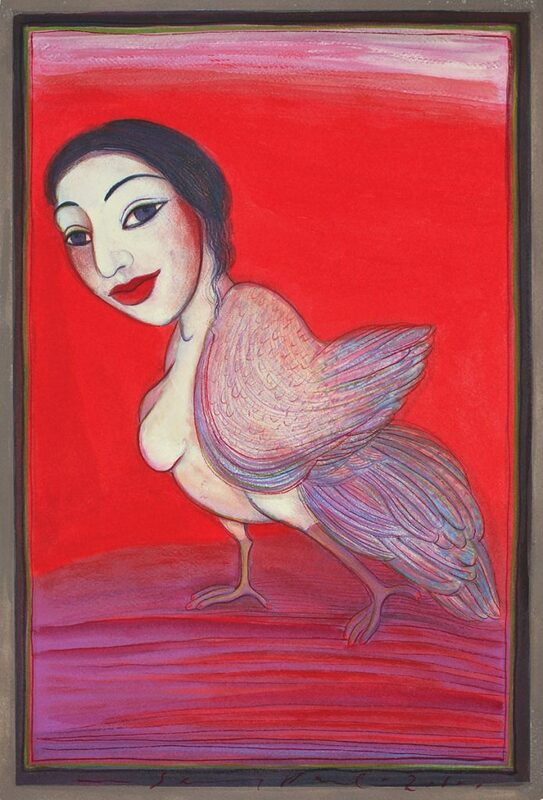 Gogi’s nayikas are an interesting and often ironical take on the heroines from miniatures – in particular Pahari paintings, and performing traditions – who are beautifully clothed and bejewelled, and whose status is largely as a coveted, desirable beloved, a beloved she waits, pines and beautifies herself for. 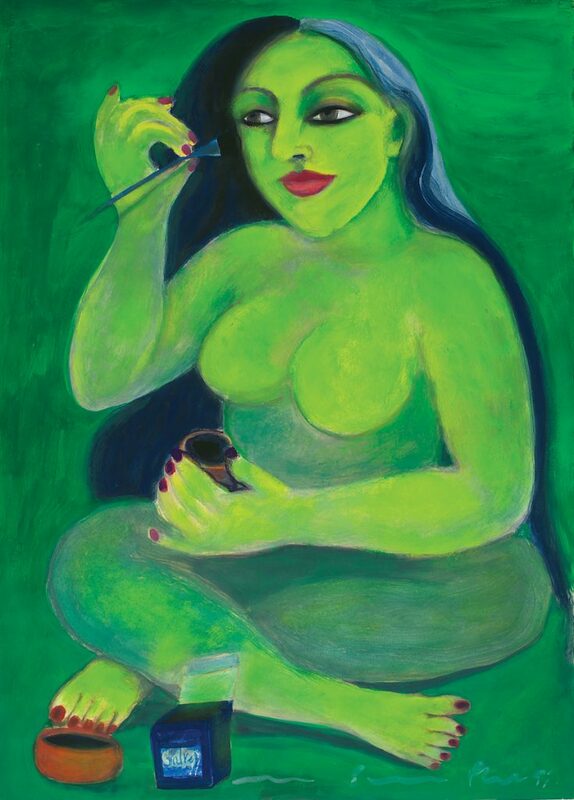 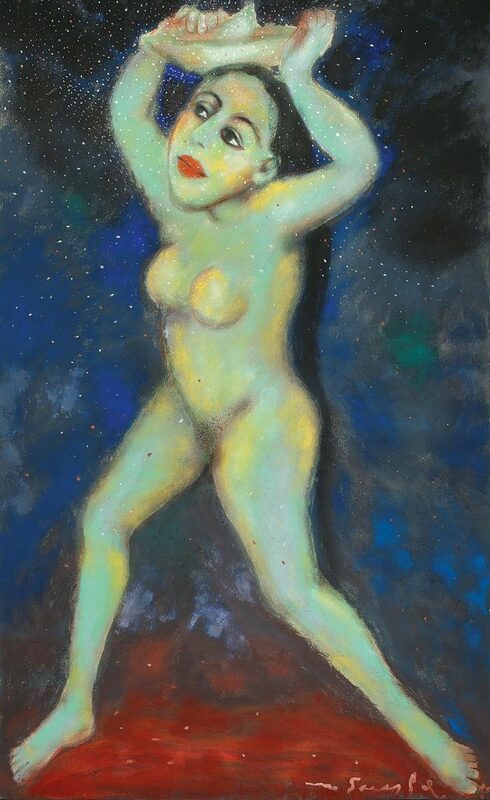 As opposed to those women, Gogi’s ‘nayikas’ cavort languorously naked in the midst of various acts of adorning themselves, an adornment that appears to be for the self, not necessarily for or requiring an external beloved; they are empowered and self-contained. 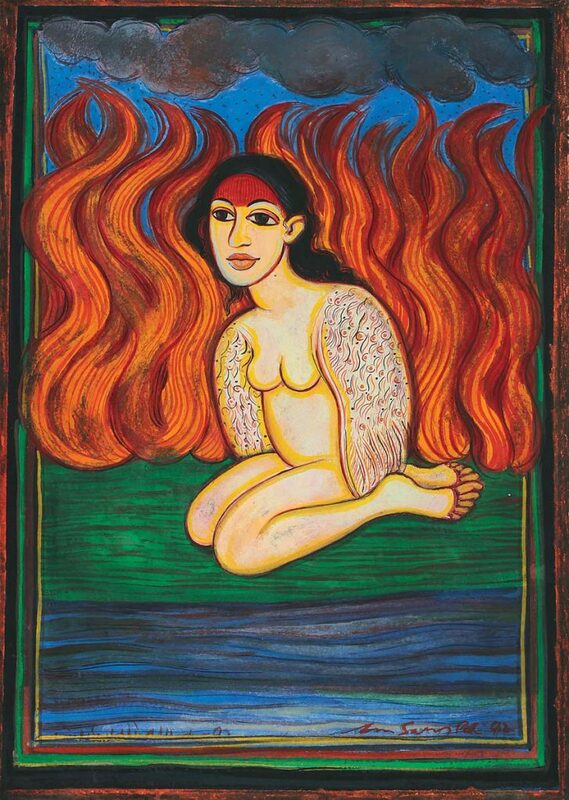 The feminine and bridal markers of red alta on their hands, feet and forehead intrigue: for their appearance of confirmation to traditional feminine stereotypes, as much as they mock them.